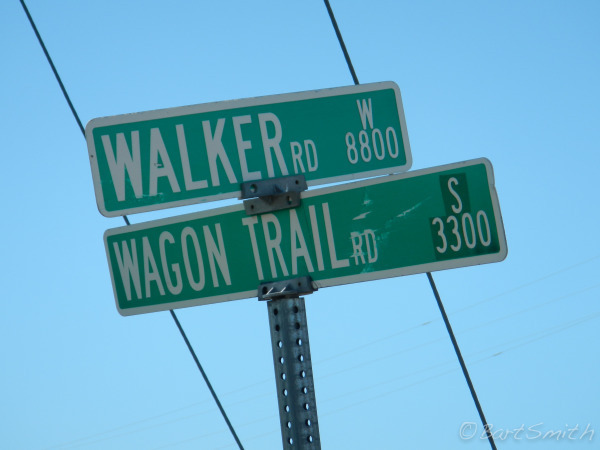 The Frontier Trail route out of Independence Missouri is well signed. 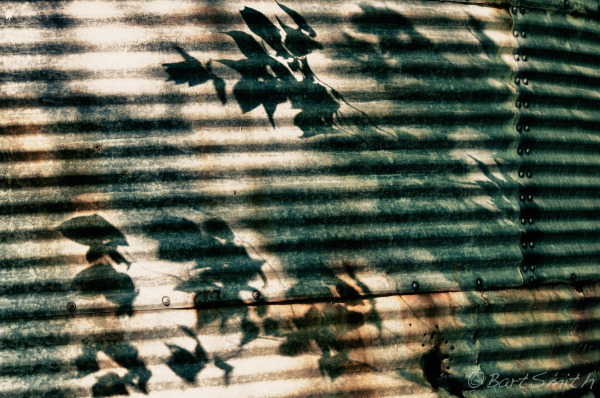 Shadows on abandoned metal bin east of Lawrence Kansas. Oregon/California Trail crossing road between Gardner and Lawrence Kansas. 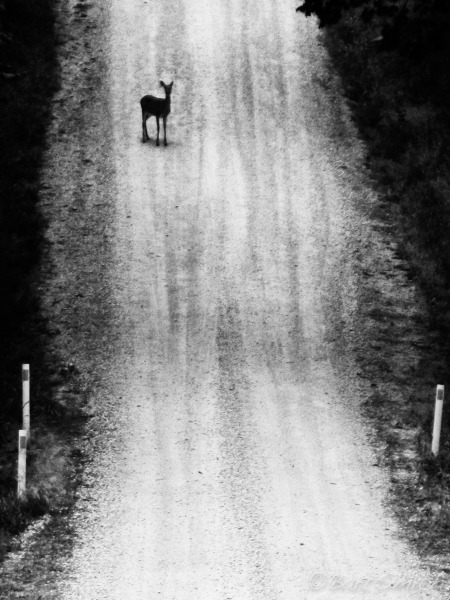 Deer on rural road of Oregon Trail between Lawrence and Topeka Kansas. 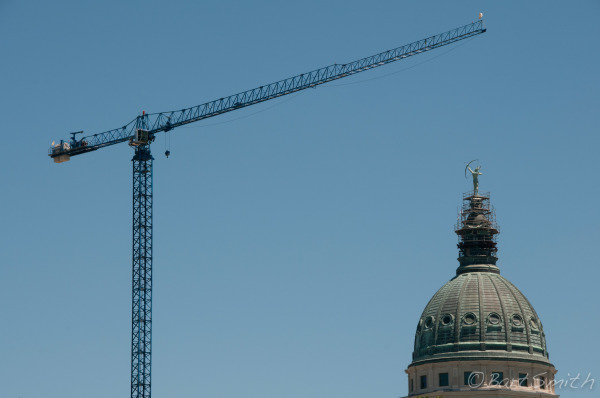 Capital of Kansas under renovation, Topeka "Back off, if you know whats good your yah". 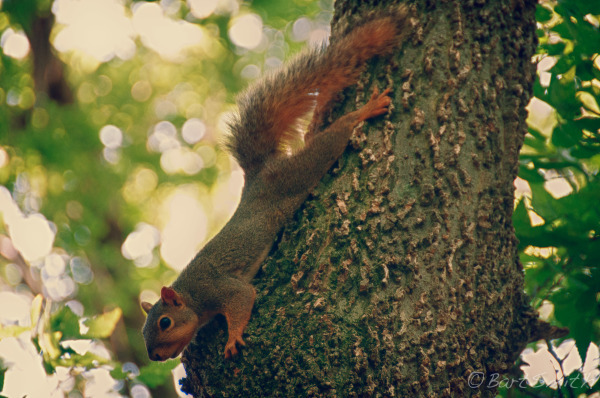 Squirrel near Red Vermillion River, Kansas along the Oregon Trail. 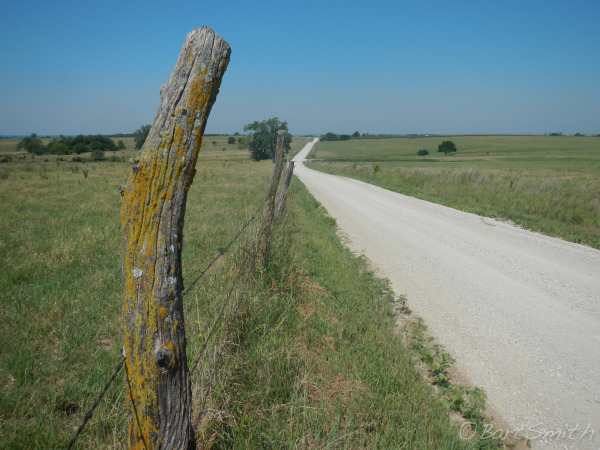 Road section between Red Vermillion River and Westmoreland Kansas. 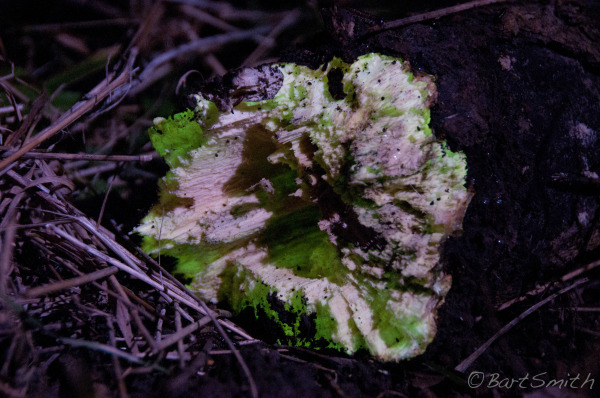 Decomposing log emitting phosphorescent glow taken near my tent site outside of the village of Westmoreland Kansas. 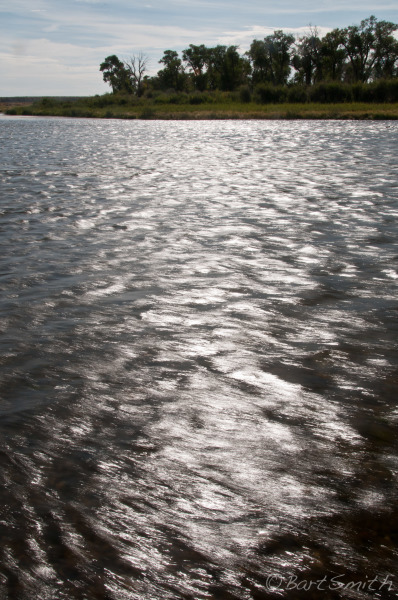 The temperature reached 112 degrees during the day which may have accelerated the bacteria. 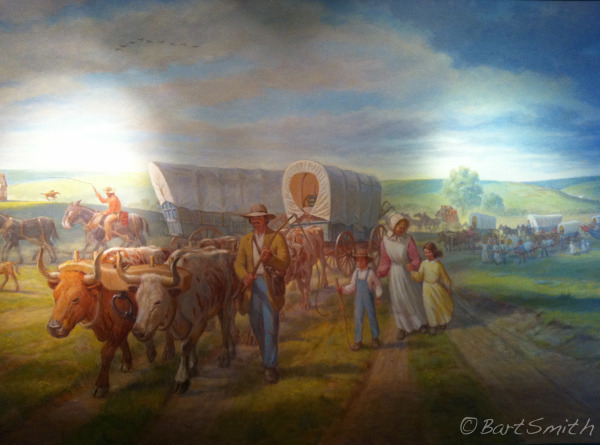 Bucolic rendering of Emigrants along the Oregon Trail through Northern Kansas. Hollenberg Museum, Kansas. Wagon at camp. 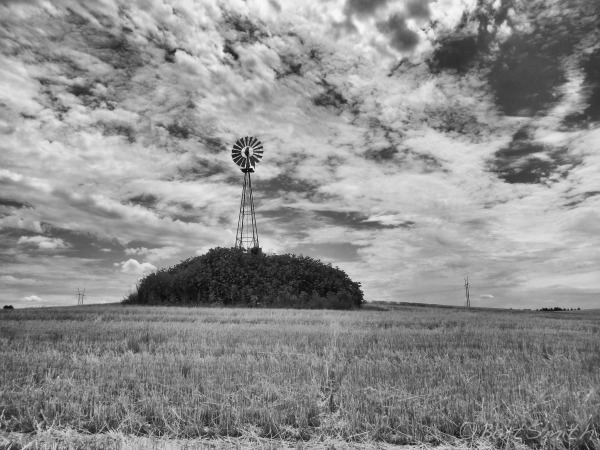 Hollenberg Ranch, Kansas. 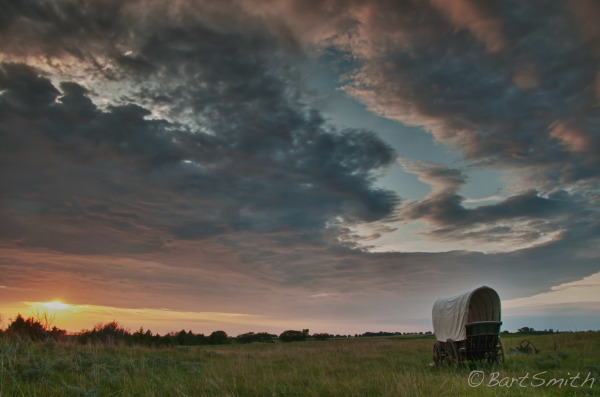 Lone covered wagon on Prairie at Rock Creek State Historic Park, Nebraska. 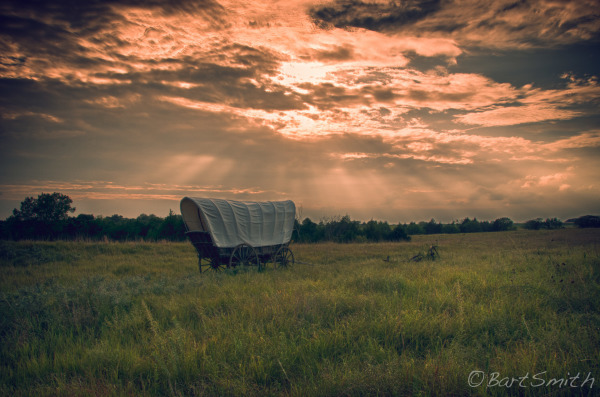 Lone covered wagon heading towards the setting sun over Nebraska prairie at Rock Creek State Historic Park, Nebraska. 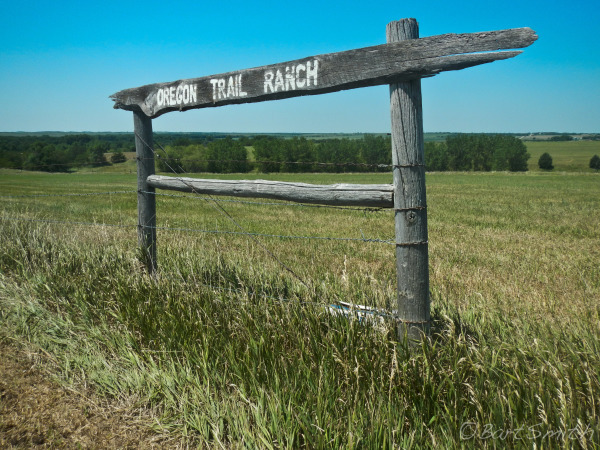 The route of the Oregon Trail through Nebraska is very well signed. High hopes. A few miles fromLittle Sandy Station, Nebraska. 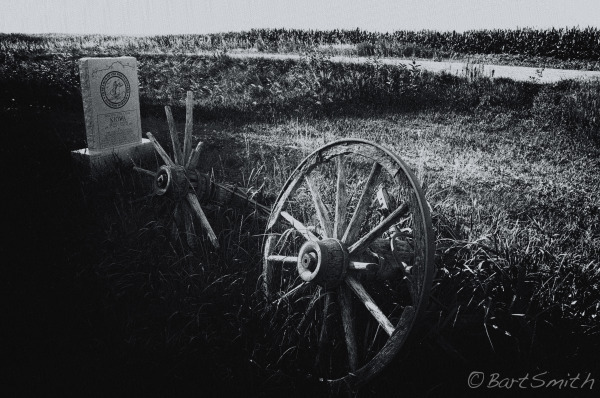 Wagon remnants beside granite marker designating the site of the Kiowa Pony Express Station along the Little Blue river, Nebraska. I say old chap, you wouldn't happen to have lighter by jiffy? 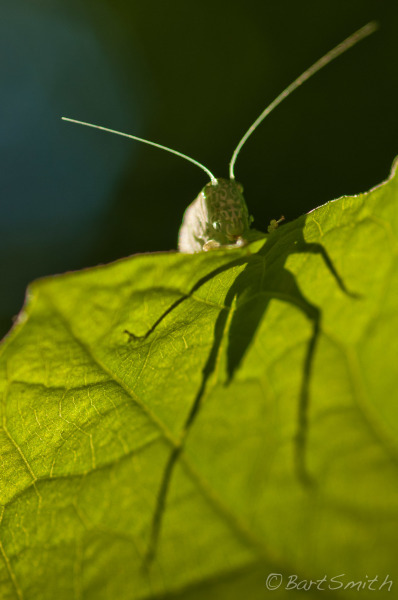 , Nebraska. 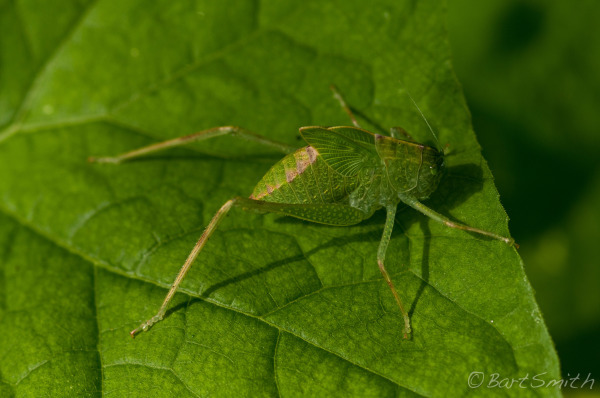 Juvenile Grasshopper, near the Little Blue River, Nebraska. 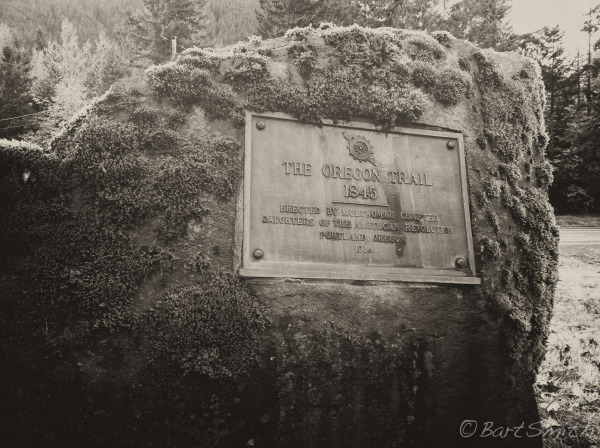 Sign above section of the Oregon Trail along the Little Blue river known as the "Narrows". 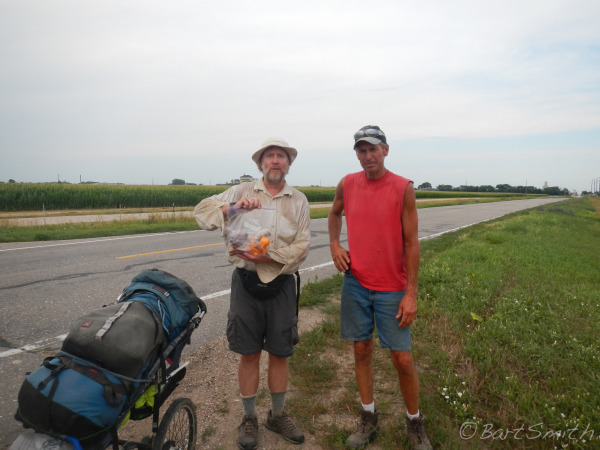 Myself with Jim Mermon, a farmer who walked with me for about five miles near Hastings Nebraska. His wife gave me a bag of goodies when she picked Jim up. Susan Hail Gravesite, she was likely a victim of cholera, passing a way near this location on June 2, 1852. She was 34. 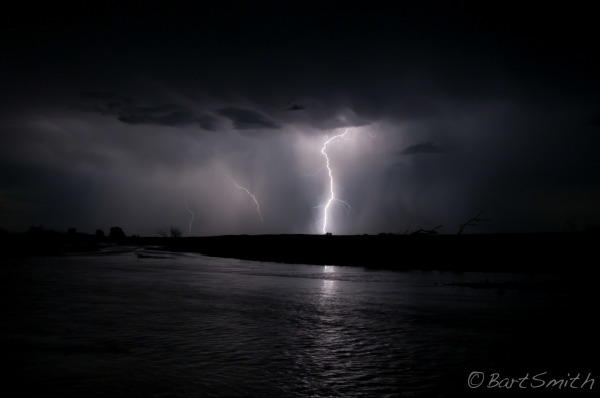 Lightening storm over the Platte River near Cozad Nebraska along the Oregon Trail. 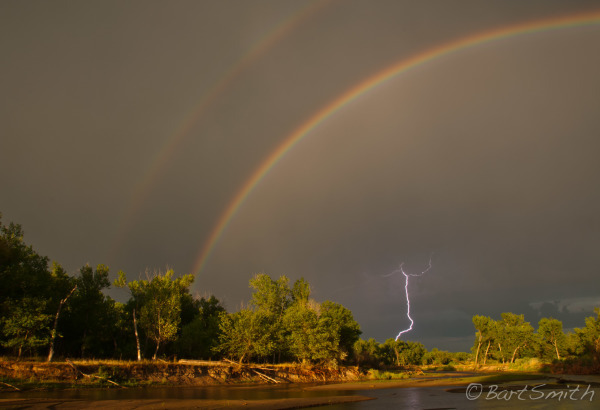 "Seeing the Elephant" Rainbow and lightening along the Platte River. Near Cozad Nebraska. 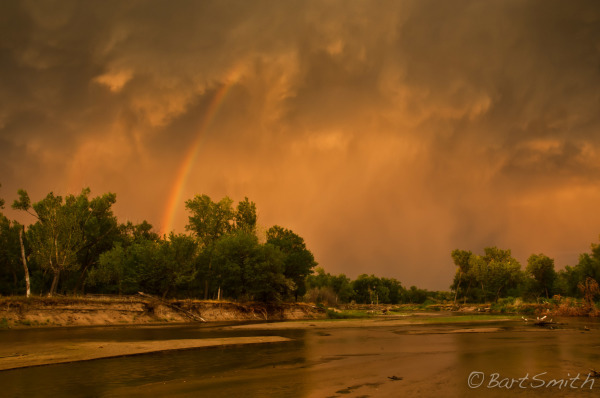 Rainbow along the Platte River from passing thunderstorm near Cozad Nebraska. 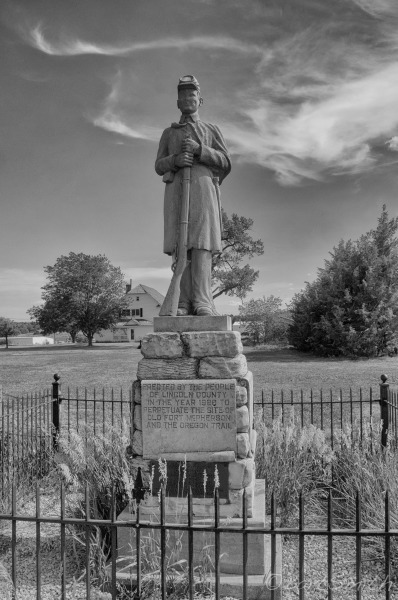 Concrete statue of frontier soldier at site of Fort McPherson, built in 1866 to counter Indian uprisings in the 1860s. 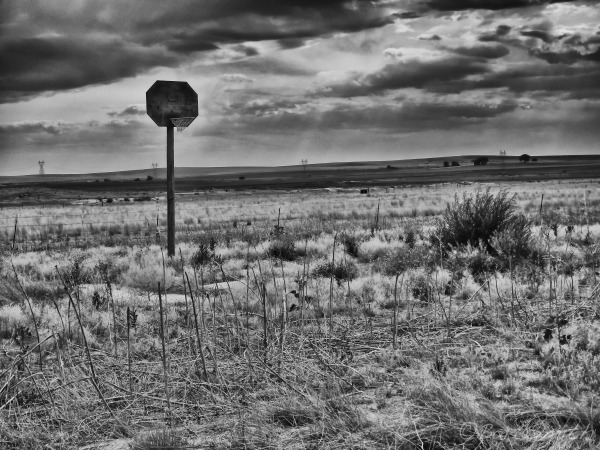 Road sign along my walk of the Oregon Trail west of North Platte Nebraska. Nebraska landscape west of Sutherland Reservoir, Nebraska. 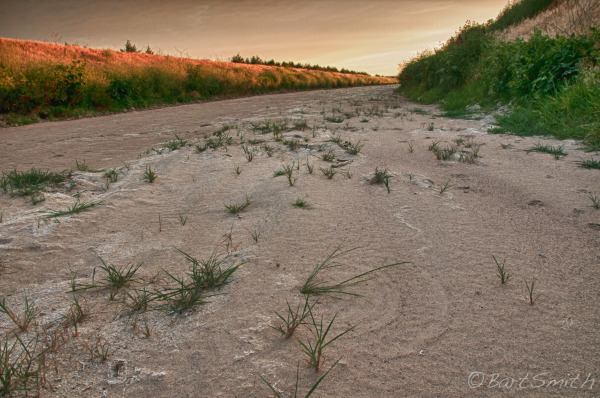 Dried out canal, effect of 2012 drought along the Platte River supply canal west of Paxton Nebraska. "I can fly circles around you, neener neener." 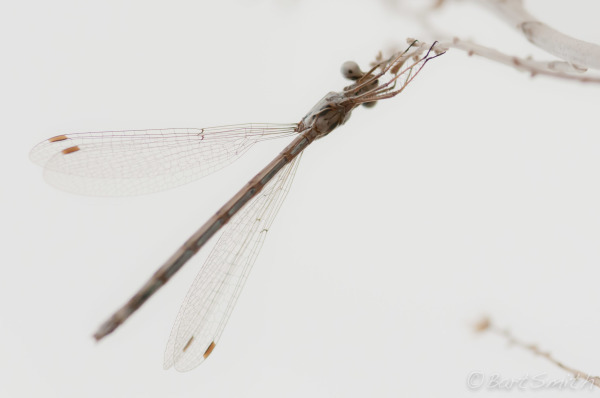 Dragonfly, Oregon trail, Nebraska. 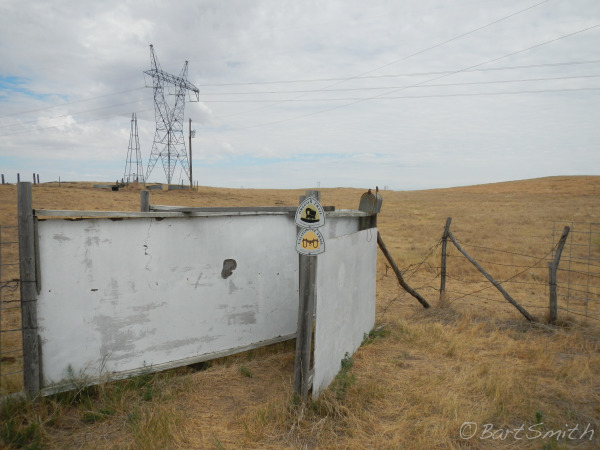 Access point to the swale of the Oregon Trail heading up California Hill west of Brule Nebraska. 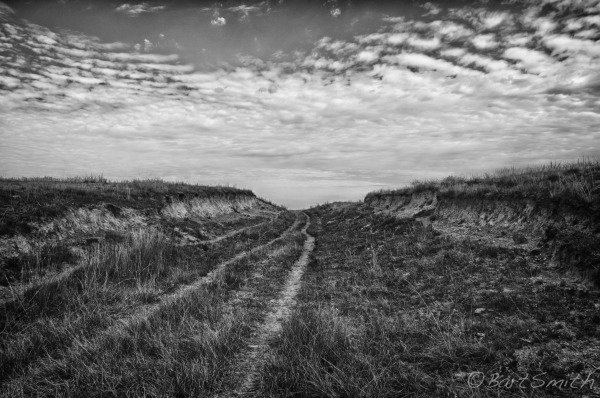 One of the most pronounce swale along the Oregon trail through Nebraska. 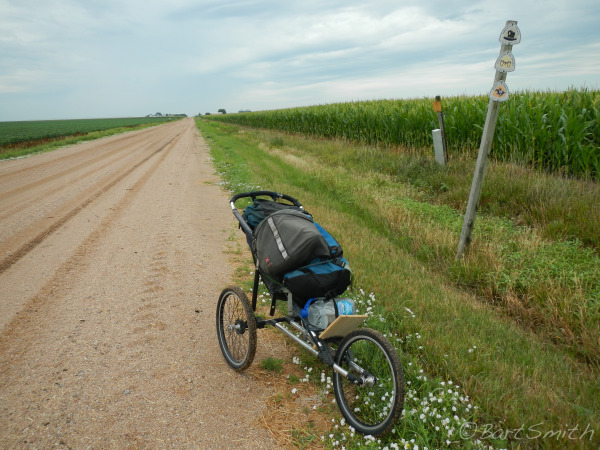 Swale of the Oregon Trail heading up California Hill west of Brule Nebraska. 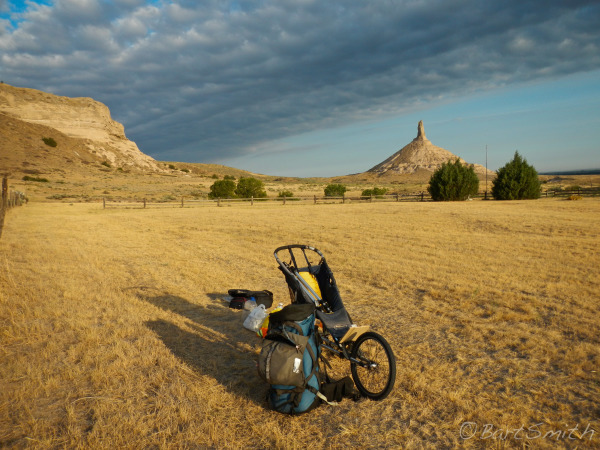 One of the most pronounced swales along the Oregon trail through Nebraska. 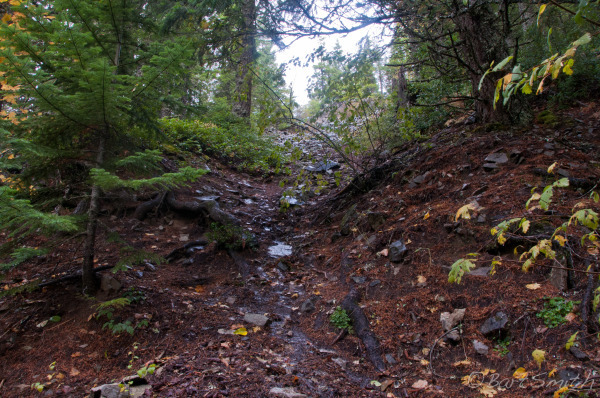 Location where the Oregon Trail begins steep descent into Ash Hollow Spring. 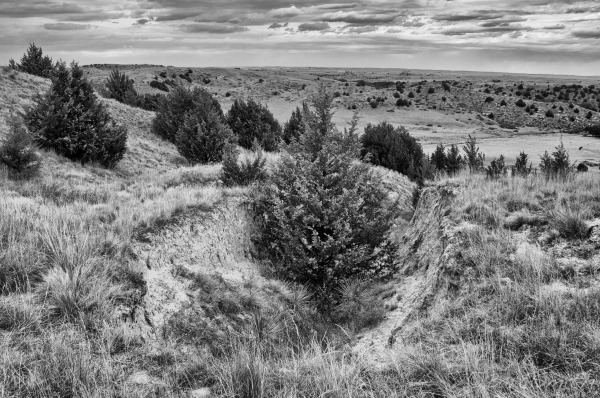 Ash Hollow State Historic Park Nebraska. From plaque memorializing the site of John Hollman's grave along the Oregon Trail near Oshkosh Nebraska. He died in 1852, likely of Cholera. 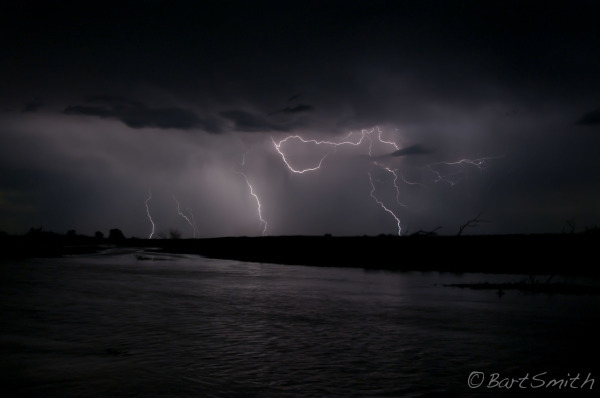 Another storm over the North Platte River, near village of Lisco Nebraska. 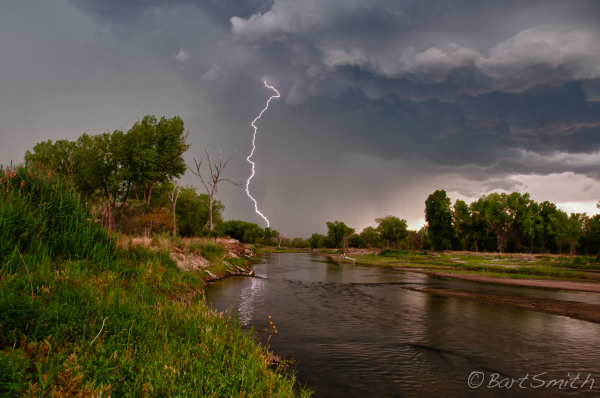 Another storm over North Platte River near village of Lisco Nebraska. Auto accident memorial beside a braid of the North Platte River west of Broadwater Nebraska. 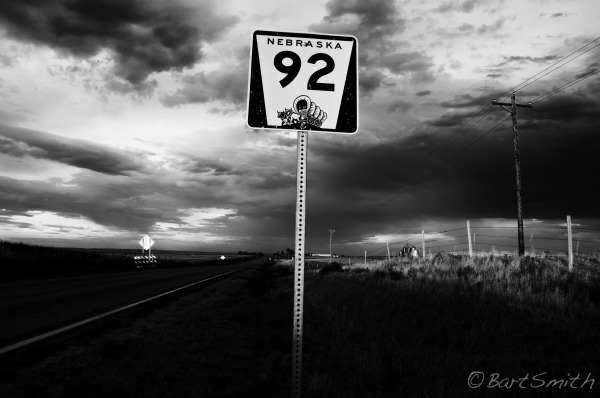 Nebraska State Highway. Platte River Valley east of Bridgeport Nebraska. 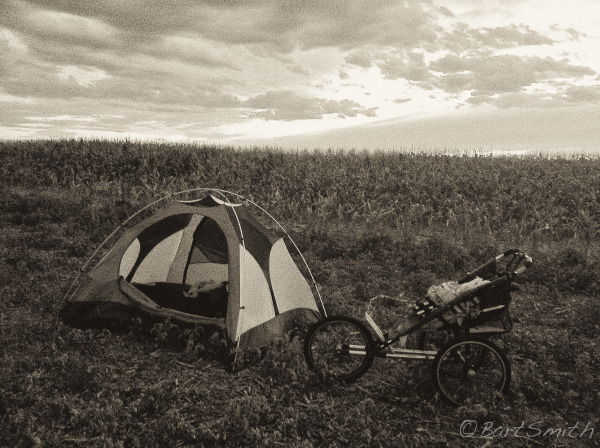 Camp in fallow field beside corn fields. Platte River Valley east of Bridgeport Nebraska. 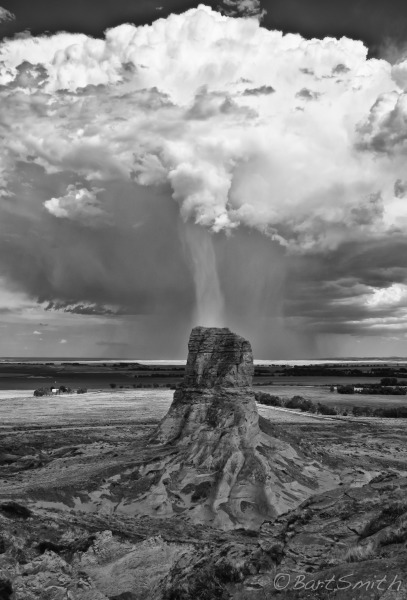 "Seeing the Elephant" Narrow rain squall falling directly behind Jail Rock viewed from Courthouse Rock. 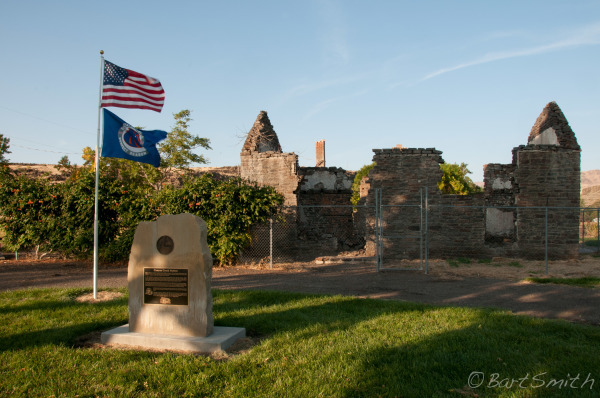 Both Jail and Courthouse Rocks were important landmarks along the Oregon Trail, Nebraska. This storm flattened my tent and spawned a tornado many miles away. 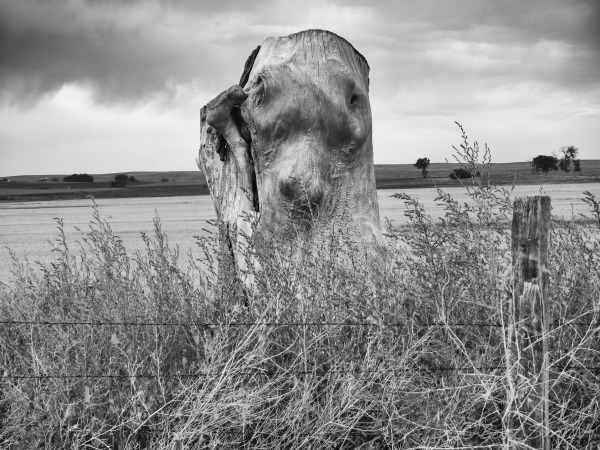 "Seeing the Elephant" Both Jail and Courthouse Rocks were important landmarks along the Oregon Trail, Nebraska. This storm flattened my tent and spawned a tornado many miles away. Expansive thunder cloud behind Jail Rock viewed from saddle with Courthouse Rock. Nebraska. 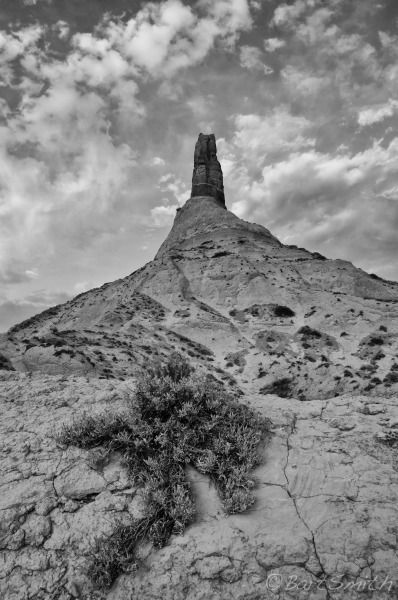 Chimney Rock viewed from eroded badlands at the west base. 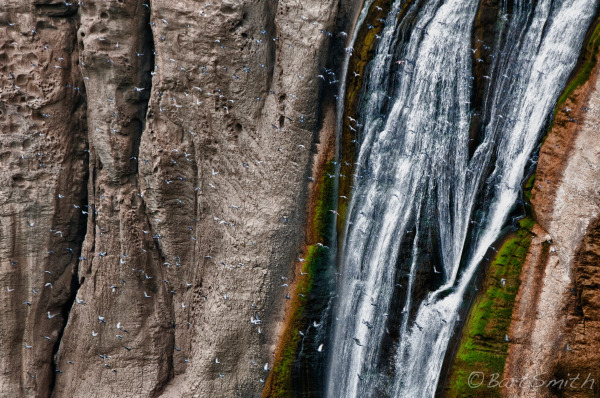 The wind blown shrub leaves scratch marks in the soft sandstone. Nebraska. Chimney Rock from the cemetery. Nebraska. 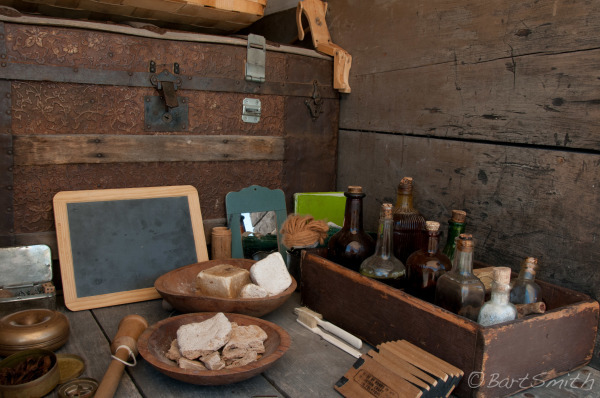 Common items carried along the Oregon Trail. Scotts Bluff National Monument, Nebraska. 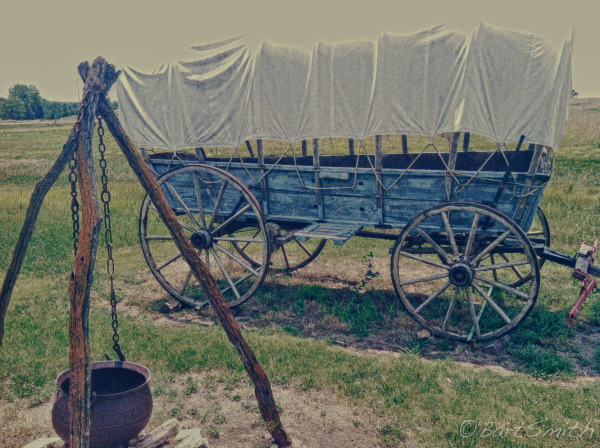 Wagons heading up to Mitchell along the Oregon Trail. 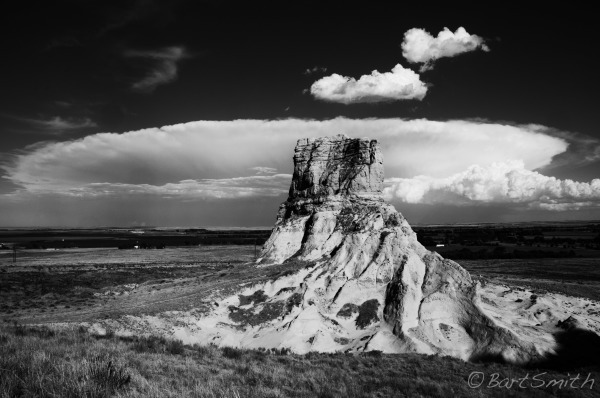 Scotts Bluff National Monument, Nebraska. 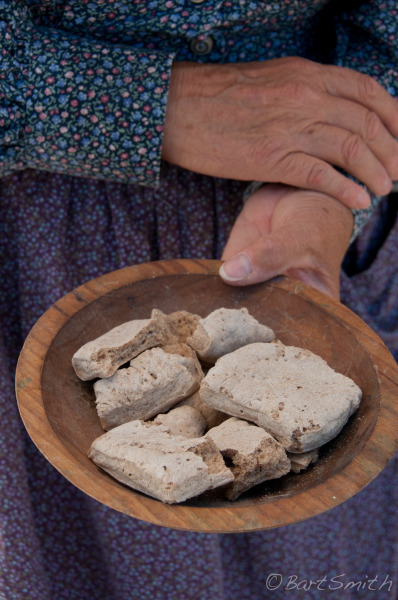 Re-enactor holding tack, a common food along the trail, essentially flour biscuits. "It travelled well, filled the belly and broke your teeth". 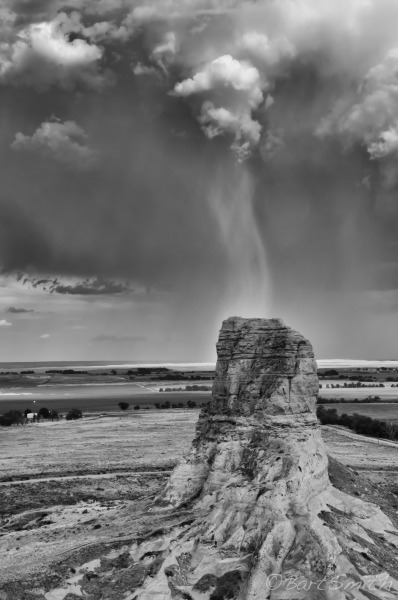 Scotts Bluff National Monument, Nebraska. 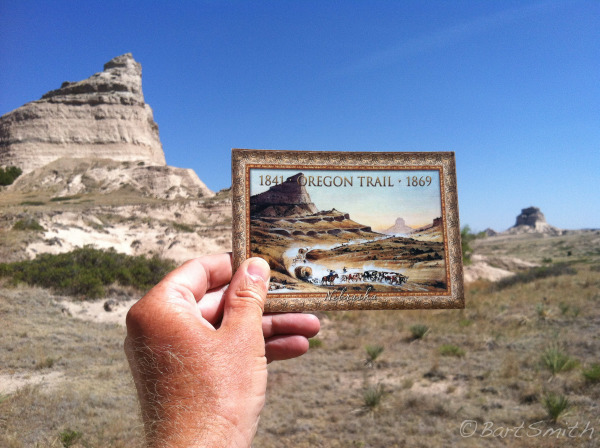 Postcard of famous painting by William Henry Jackson depicting the Oregon Trail from Mitchell Pass. 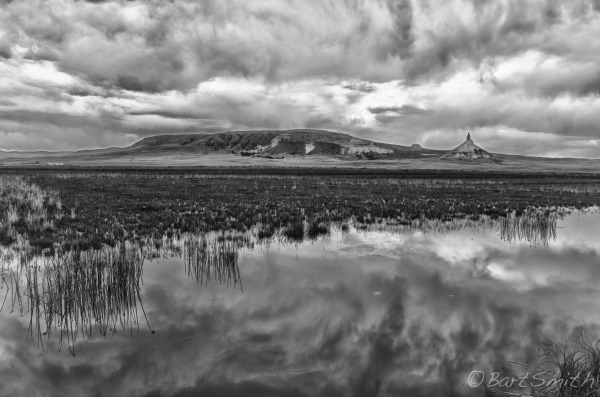 Scotts bluff National Monument. Nebraska. 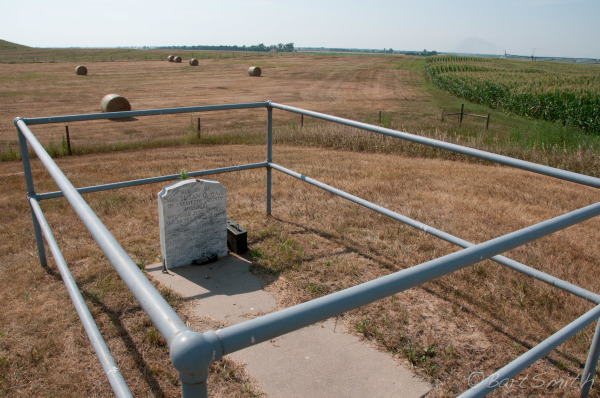 Grave site of Lucinda Rollins just outside Guernsey Wyoming. 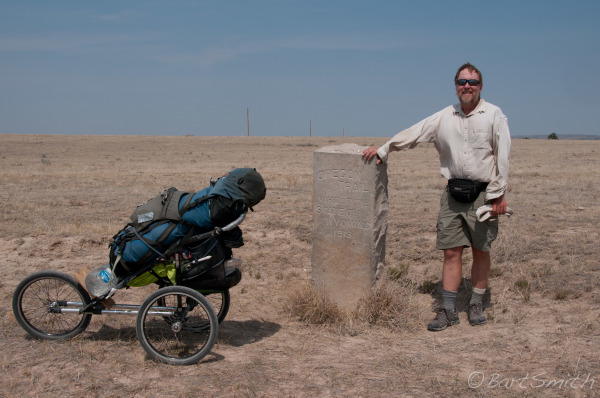 Bart beside stone marker placed by Ezra Meeker designating the route of the Oregon Trail west of Guernsey Wyoming. 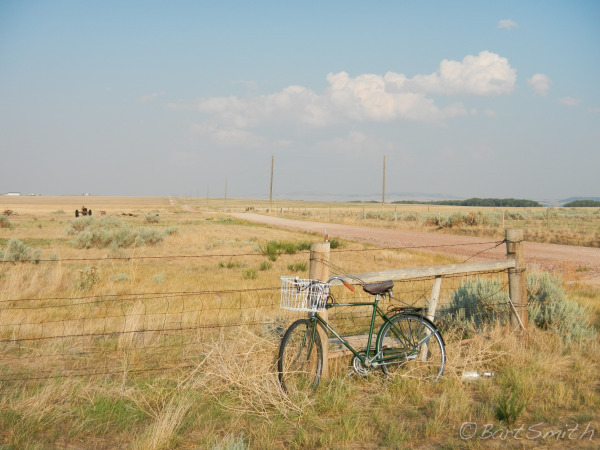 Whimsical bicycle along Oregon trail west of Glendo Wyoming. Very rare photo of a Jackelope. West of Douglas Wyoming. 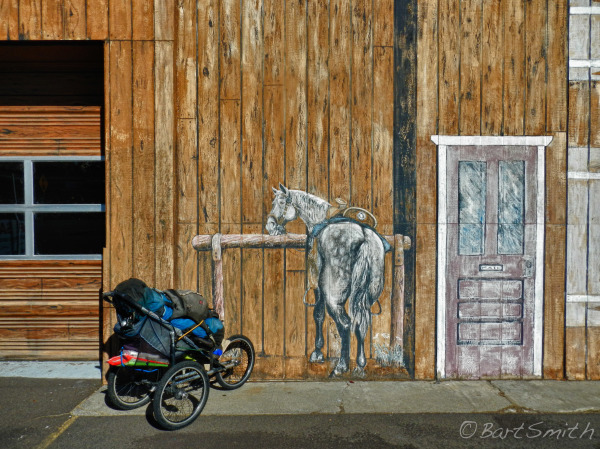 "The Outliers", downtown Douglas Wyoming. 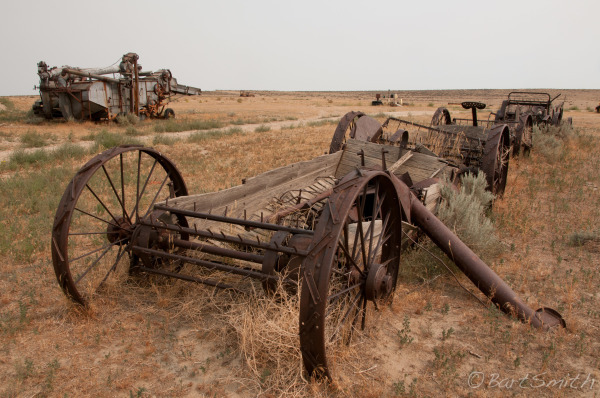 Old farm machinery along the Council Bluffs route of the Oregon Trail east of Glenrock Wyoming. Gravesite of A.H. Unthank. 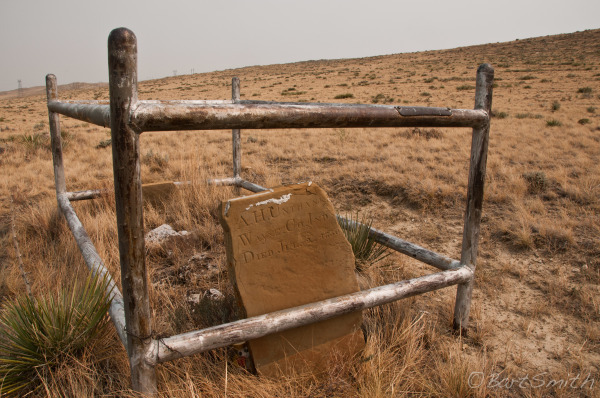 A young man who succumbed to Cholera along the Oregon Trail a few miles east of Glenrock Wyoming. 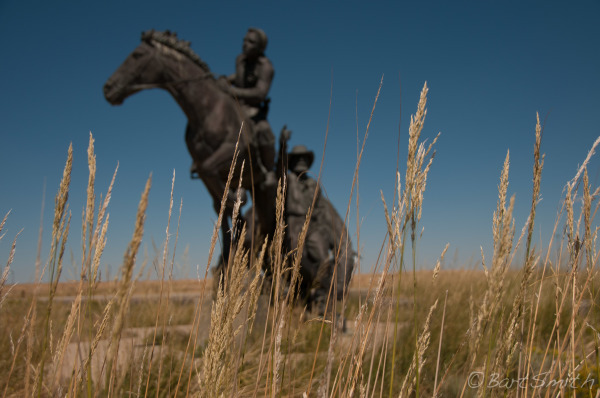 Sculpture outside of the National Historic Trail Interpretive Center, Casper Wyoming. 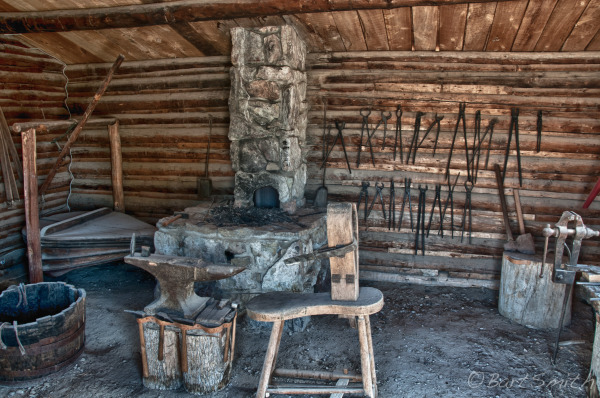 Blacksmith shop at Fort Caspar Wyoming. 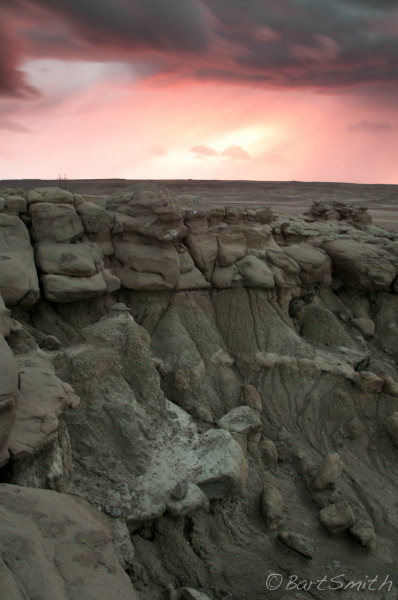 Eroded sandstone formations along "The Avenue of Rocks", a geologic landmark along the Oregon Trail west of Casper Wyoming that many of the Emigrants called "Devils Backbone". 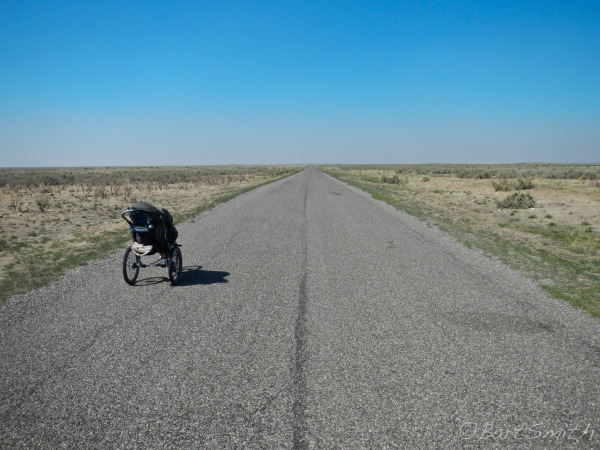 Heading west along the Oregon Trail west of Prospect Hill Wyoming. 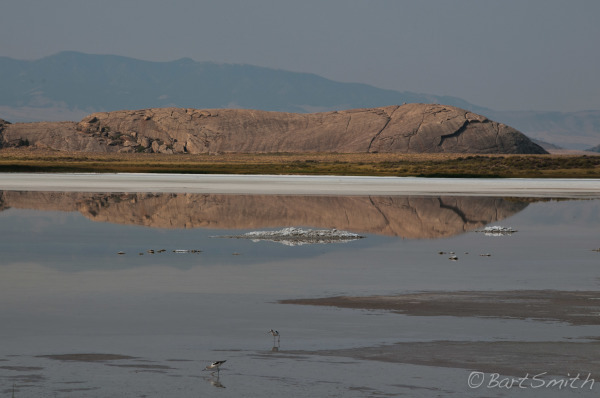 Independence rock reflected in Lake Playa. 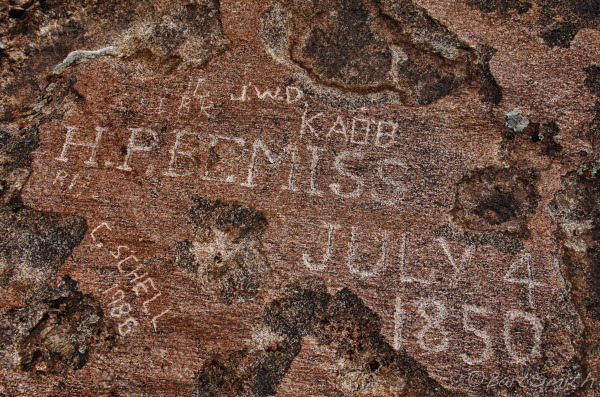 There are over 800 emigrant signitures carved into Independence Rock. It got it's name because the emigrants hoped to reach the rock by 4th of July to ensure snow free travel over the Blue and Cascade Mountains later in the journey. 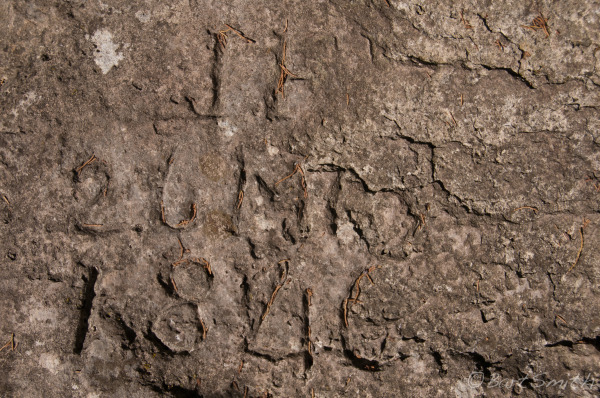 Emigrant signature in Independence Rock appropriately etched on July 4th 1850. 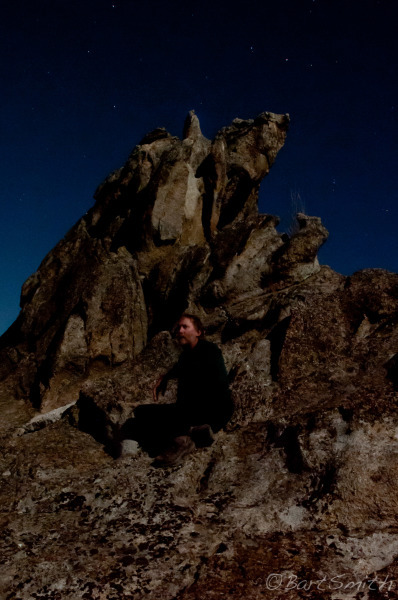 There are over 800 emigrant signatures carved into Independence Rock. It got it's name because the emigrants hoped to reach the rock by 4th of July to ensure snow free travel over the Blue and Cascade Mountains later in the journey. 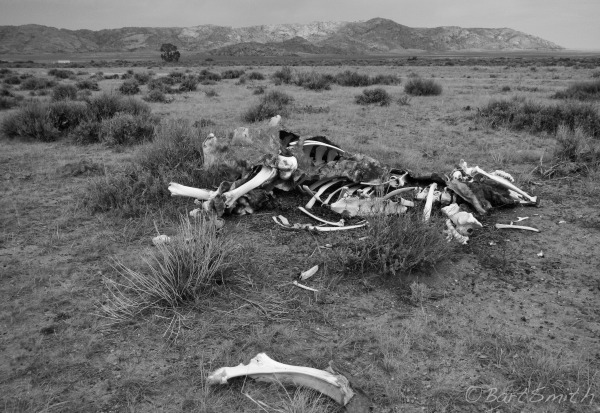 Cow carcass along the Oregon Trail. Wyoming. 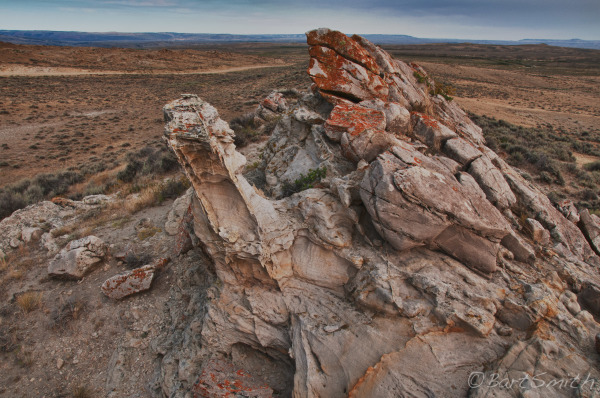 Split Rock along section of the Oregon Trail which today runs through private property of Sun Ranch. I was given permission to walk through. Jeffrey City Wyoming. 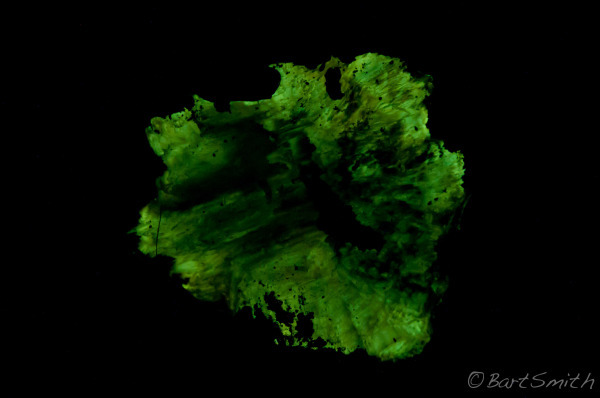 A uranium mine nearby gave Jeffrey City a brief boom in the 50s and then even briefer in the 80s. It is now a ghost town with a few hardy residents. Along the Oregon Tail heading west towards Rocky Ridge and South Pass. Wyoming. 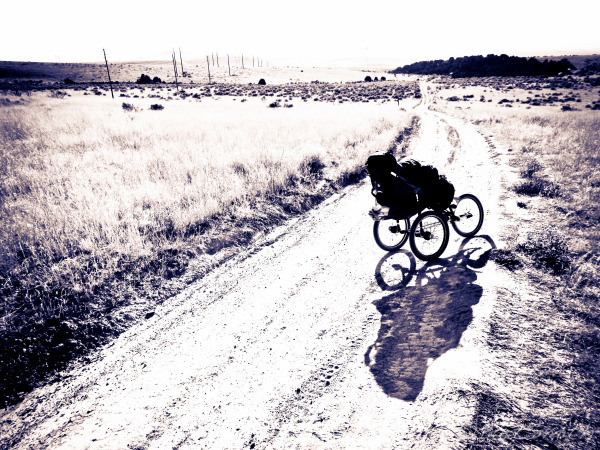 Along HW 28 nearing South Pass Wyoming. 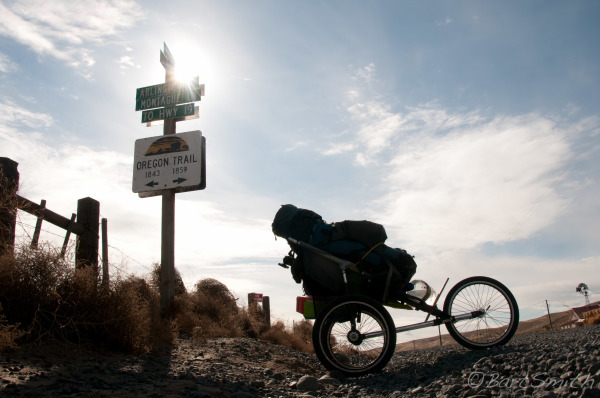 South Pass, where the Oregon/California/Pony Express/Mormon Trails cross from the Atlantic drainage to the Pacific drainage.. The stone memorial was placed by Ezra Meeker in (I believe) 1906. 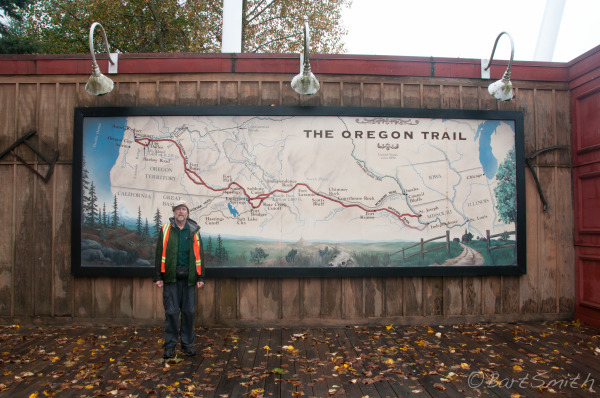 Thanks buddy for all your efforts to memorialize the historic trail west. 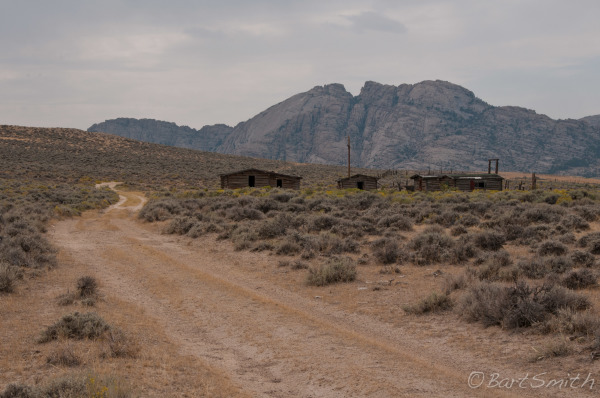 Remnants of the Ghost town of Pacific Springs, a few miles west of South Pass Wyoming. 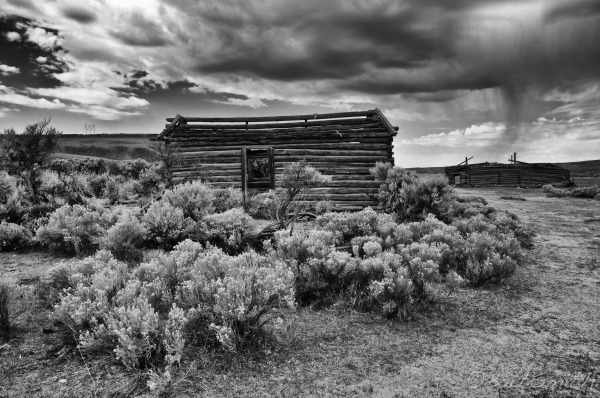 It was more of a ghost ranch than town. 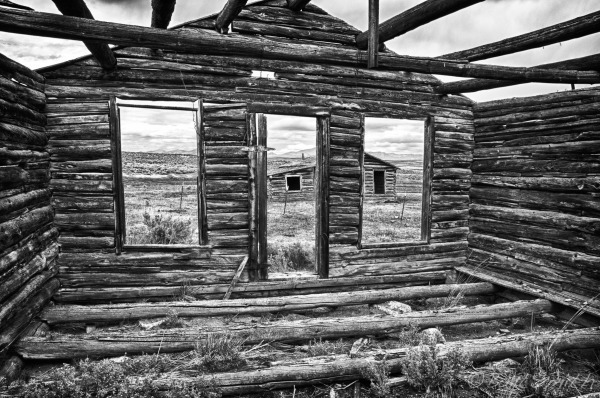 Remnants of the Ghost town of Pacific Springs, a few miles west of South Pass Wyoming. 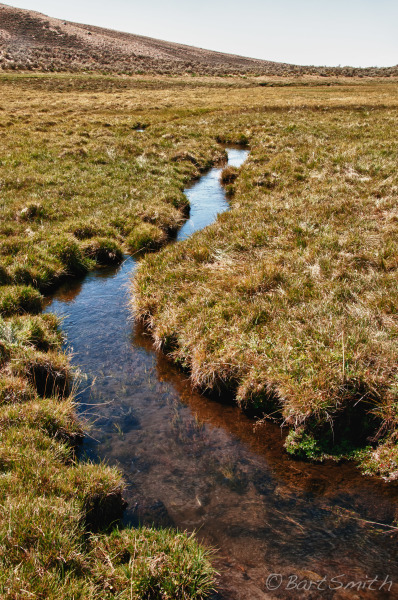 Pacific Springs creek, the first water the Emigrants encountered which flowed west to the Pacific Ocean, a few miles west of South Pass. Wyoming. 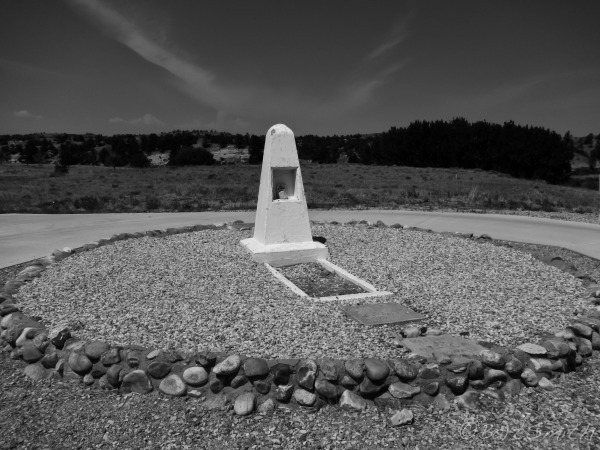 Monument along HW 28 designating the "parting of the ways" for those emigrants who chose to take the Seminol Cutoff. This monument, however is now believed to be a substantial distance from the true Parting of the Ways. 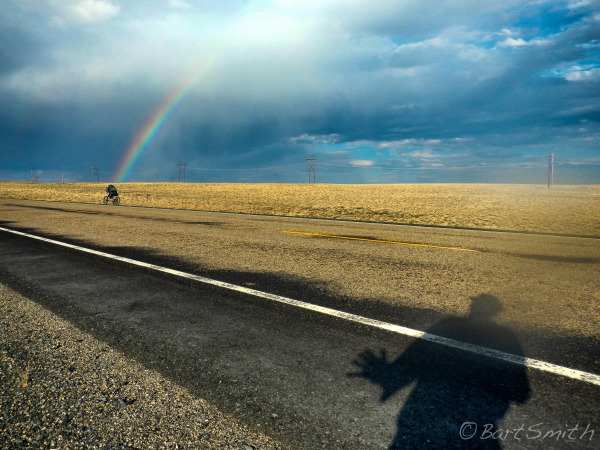 Along HW 28 Wyoming. 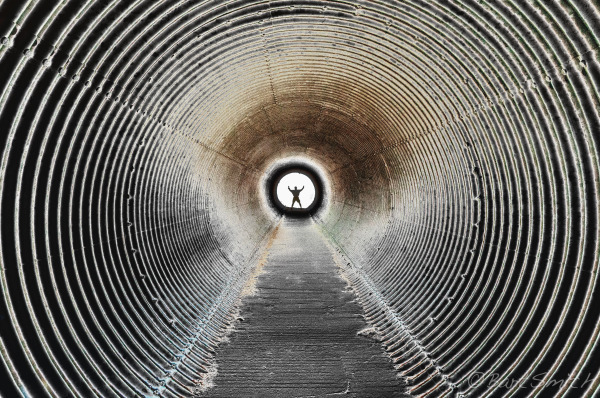 Infinite Dust after setting the self timer on the camera affixed to a tripod in a culvert for a shaded lunch on another hot day along Oregon trail through Wyoming. 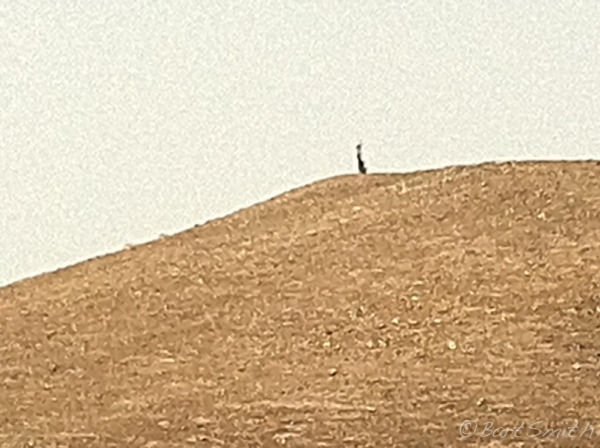 Near Simpsons Hollow. 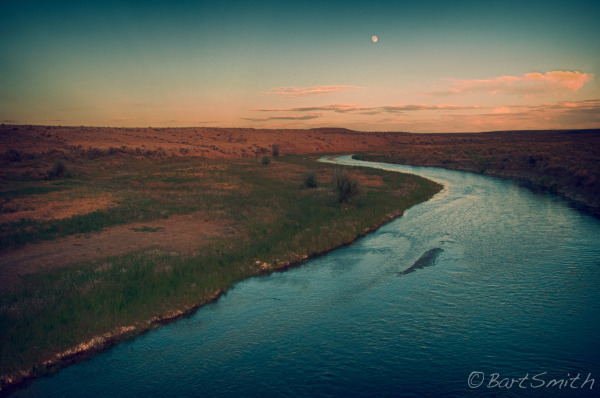 Moon rise over The Big Sandy River near Big Timber Pony Express Station site. Wyoming. 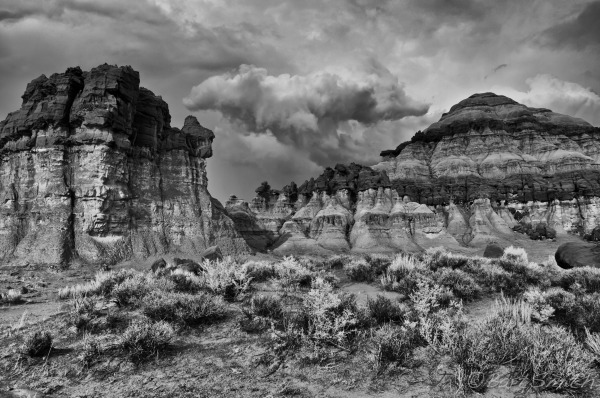 Storm clouds over Church Butte, an important landmark along the Oregon Trail in western Wyoming. 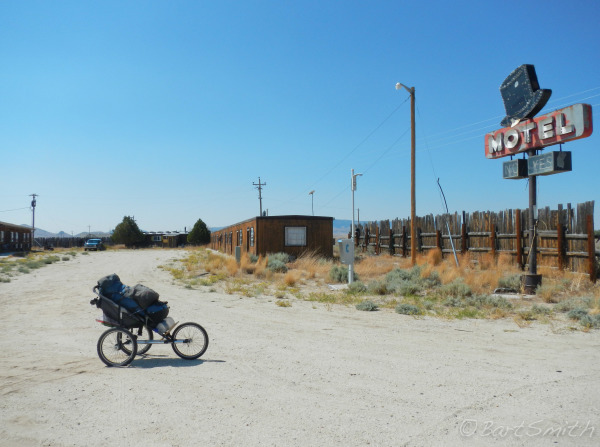 A Pony Express Trail station was positioned nearby. 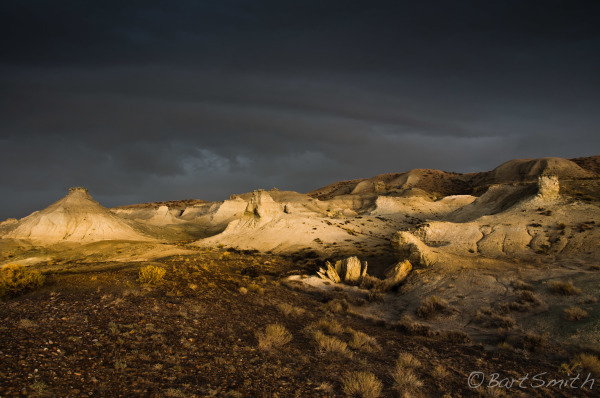 Goblins, evening light west of Church Butte along the Oregon Trail. Wyoming. 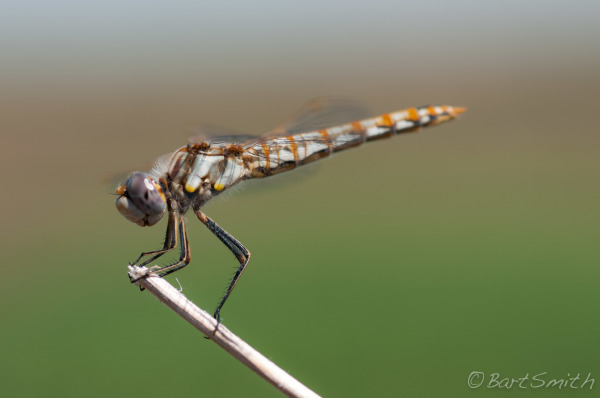 Dragonfly I photographed while resting along the Oregon trail west of Montpelier Idaho. 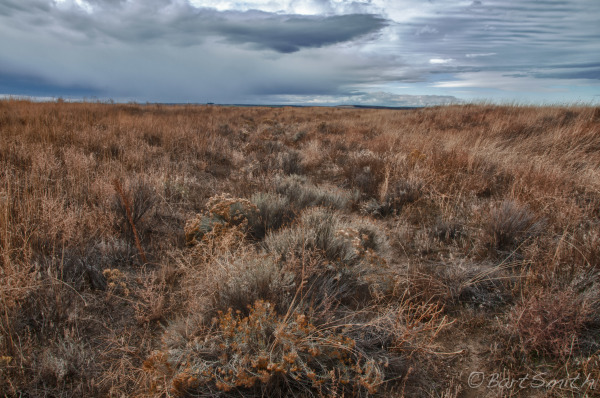 Along HW 30 and the Oregon trail west of Montpelier Idaho. 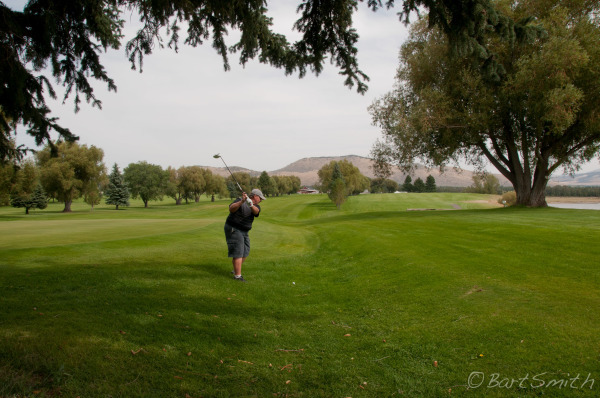 Oregon trail ruts still visible through Soda Springs Golf Course. 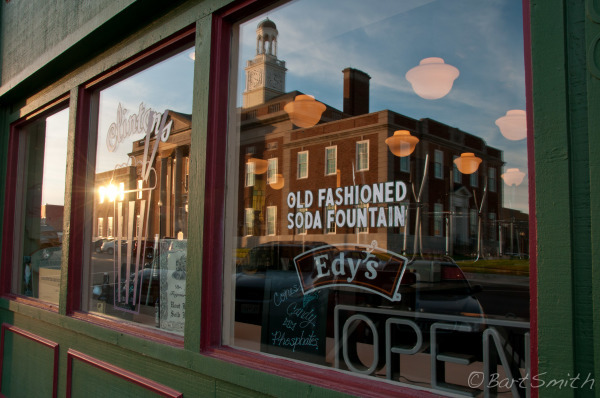 Soda Springs Idaho. 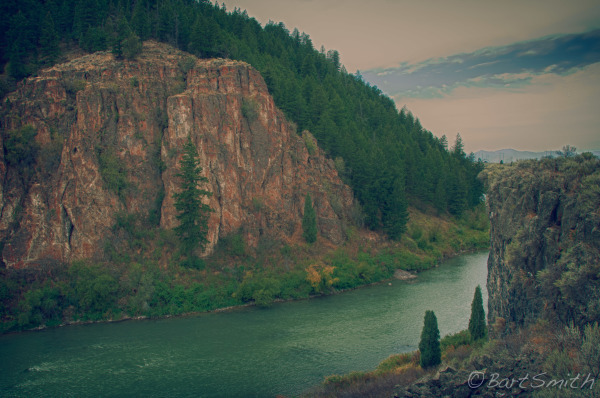 Sheep Rock over Bear River. 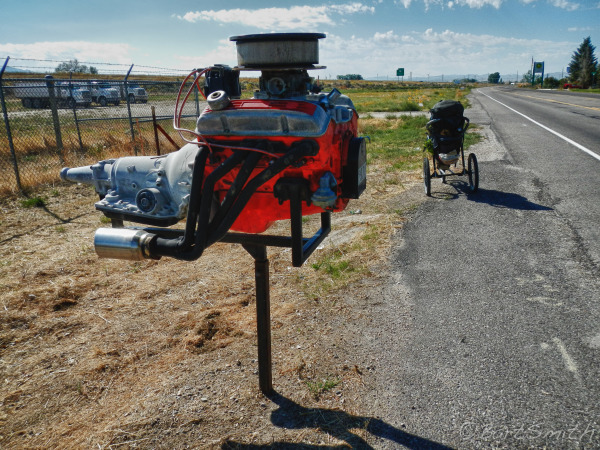 One mile west of Soda Springs Idaho. 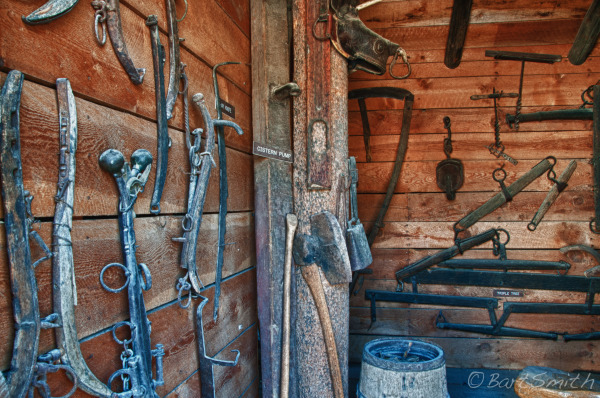 Tools and yokes displayed in replica of Fort Hall, Pocatello Idaho. 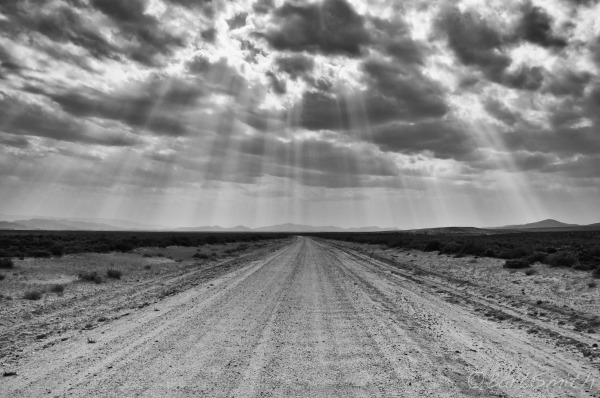 Rough road a few miles west of Pocatello Idaho. Room with a view. 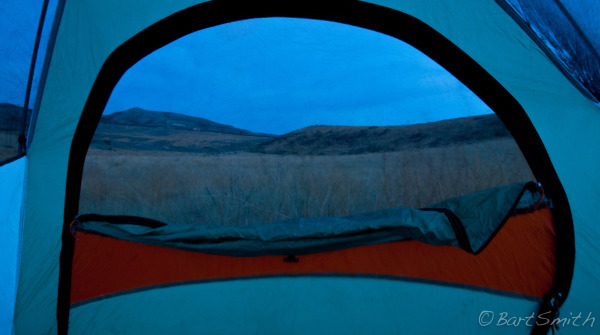 Camp a few miles west of Pocatello. 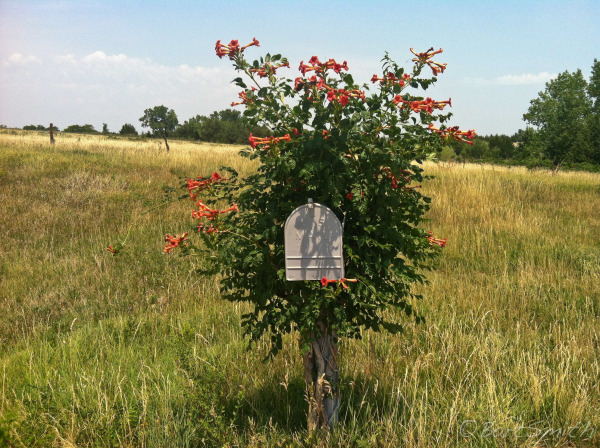 Very creative mailbox on the outskirts American Falls, Idaho. 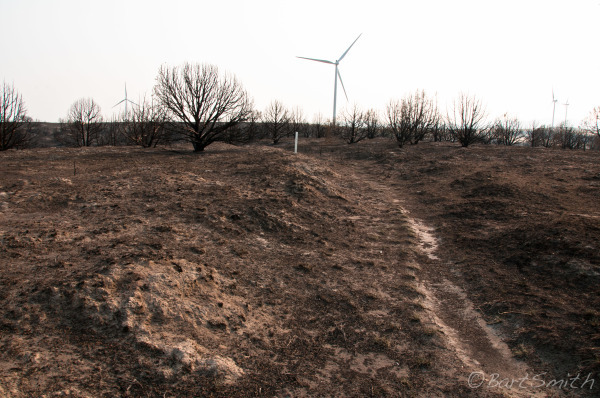 Swale of Oregon Trail through recently burned section of Massacre Rocks State Park. 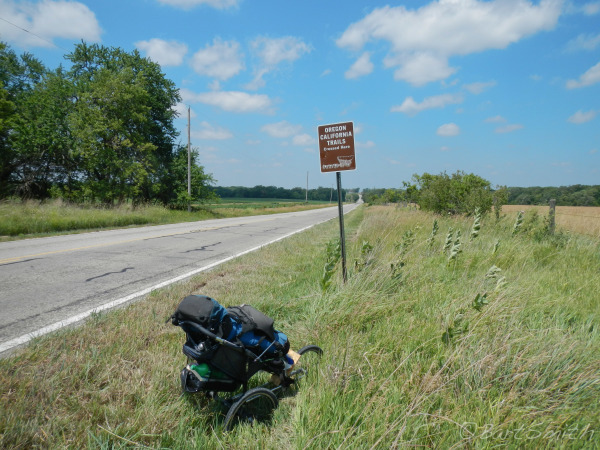 It was near here that a small wagon train was attacked by Native Americans. 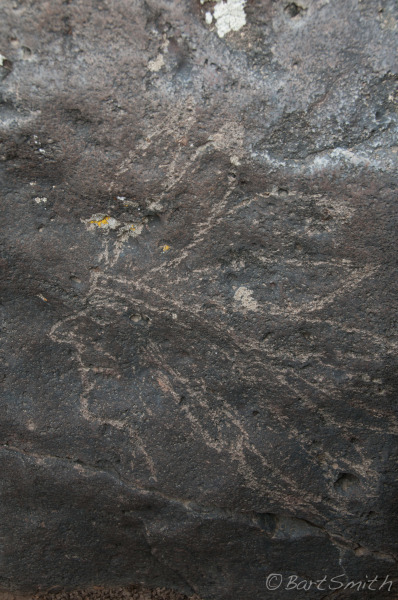 An etching by a 7 year old emigrant boy in 1866 of an Indian Chief at Register rock State Park. Idaho. Baseline Road heading towards Rupert Idaho. 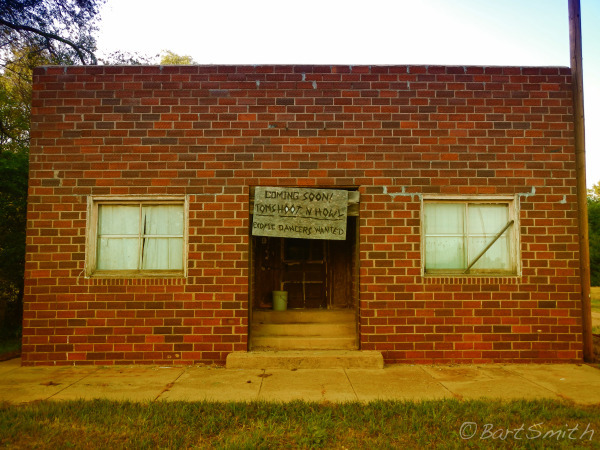 Food storage building and sometimes jail at Sticker Store. 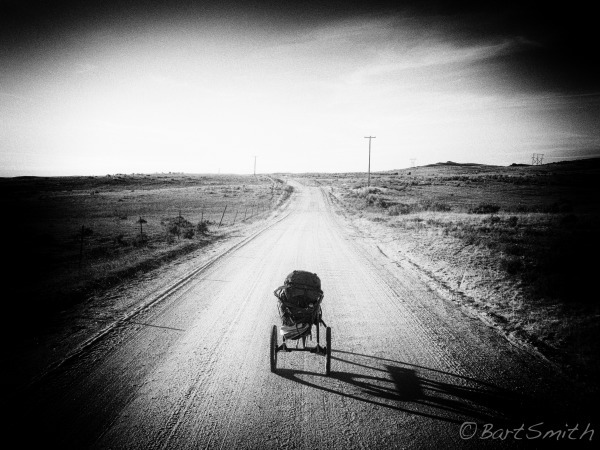 It provided provisions to emigrants along the Oregon trail during the later years of the migration. 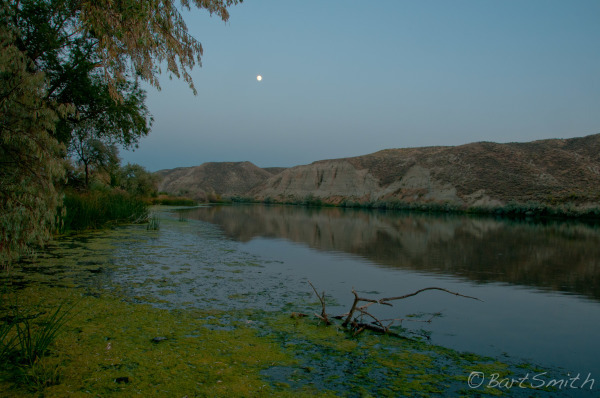 South east of Twin Falls Idaho. 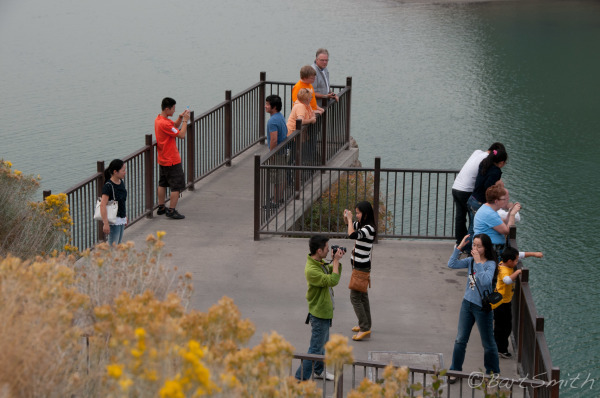 Visitors enjoying Shoshone Falls Overlook along the Snake river at Shoshone Falls State Park Idaho. Shoshone Falls along the Snake river at Shoshone Falls State Park Idaho. 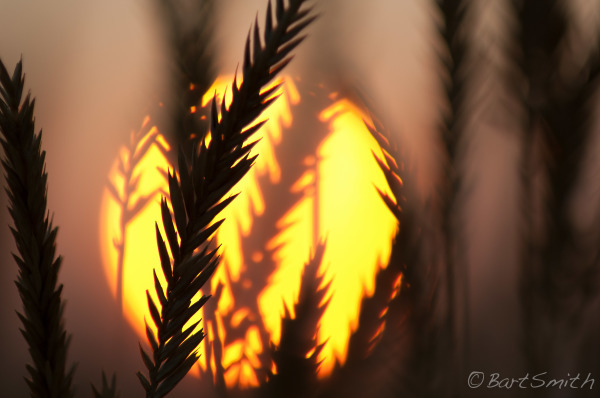 Sun setting through wheat along Black Butte section of Oregon trail. Idaho. 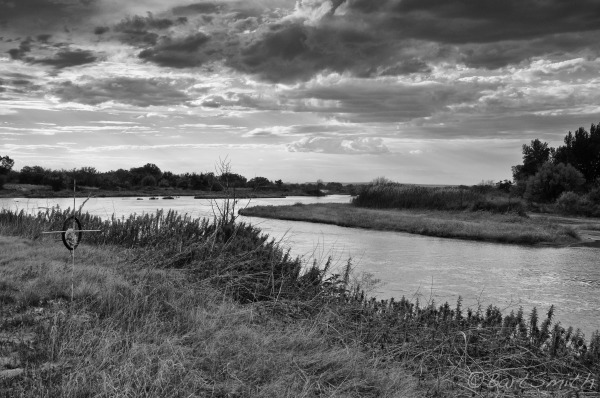 Three Island Crossing where the Emigrants crossed the Snake River. Near Glenns Ferry Idaho. Ruins of Canyon Creek Station. 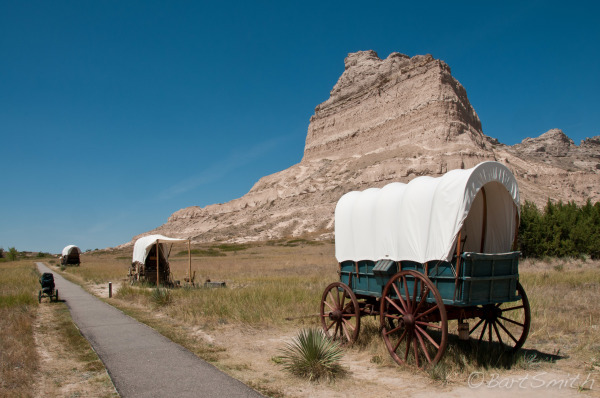 It was built in 1873, after the major migration along the Oregon Trail but the location was a popular campsite. Becoming less visible over time this name was painted on Inscription Rock by an emigrant using axel grease from the wagon. Inscription Rock Idaho. 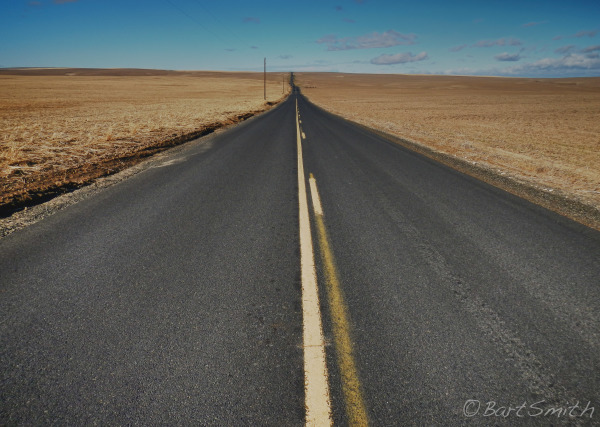 Open road along the Oregon Trail east of Boise Idaho. 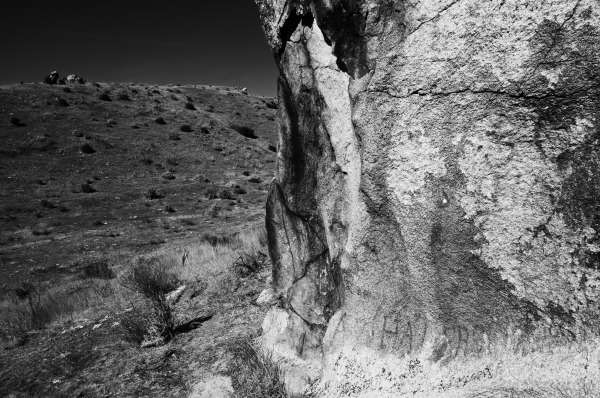 Granite boulders and outcropping along the Oregon Trail, Idaho. 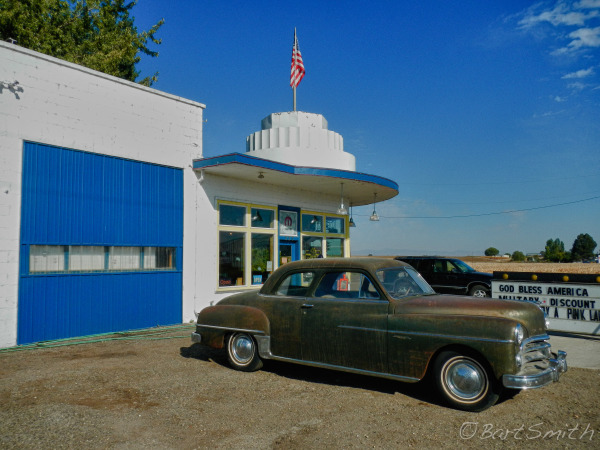 Cool restaurant in Notus Idaho. 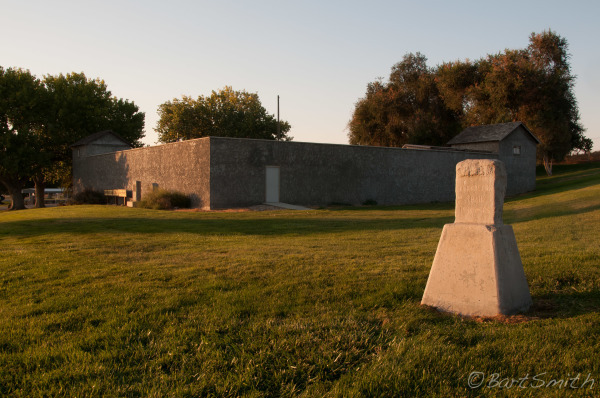 Replica of Old Fort Boise in Parma Idaho. 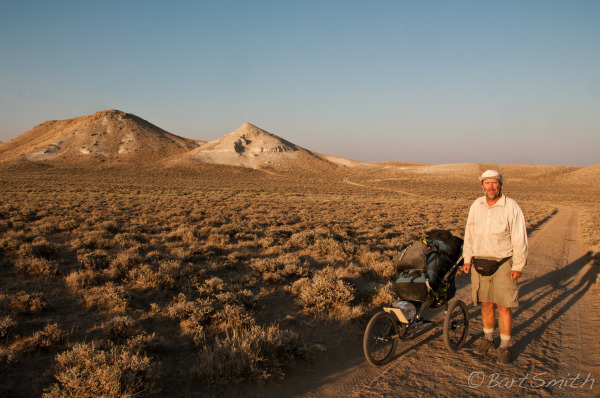 Jan Boog walking the Oregon Trail through a remote region of Eastern Oregon, 2012. 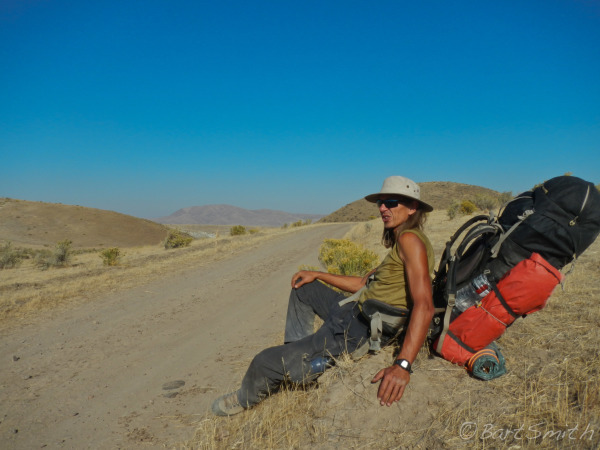 Jan Boog resting on his journey along the Oregon Trail in a remote region of Eastern Oregon, 2012. 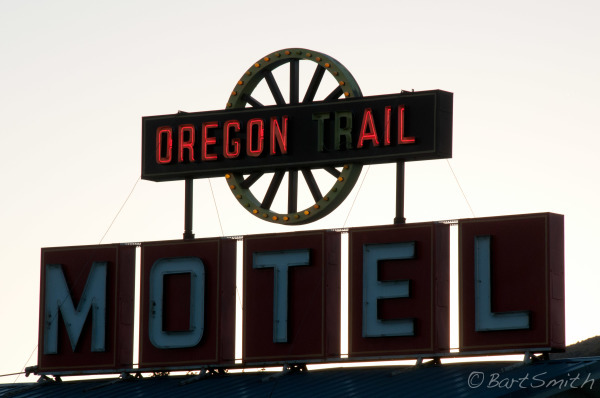 Three of my favorite things: Oregon, Beer and Motels. Oregon Trail Motel, Baker City, Oregon. 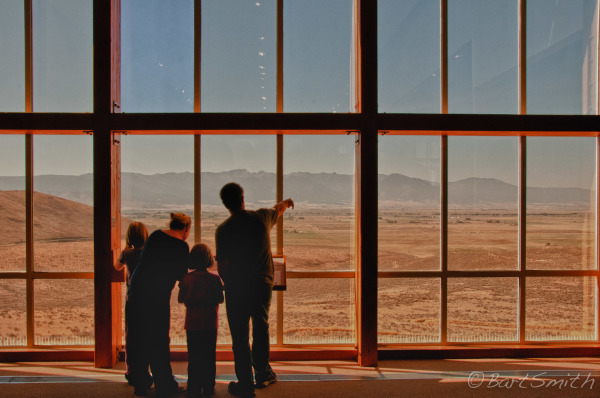 Vista from National Historic Oregon Trail Interpretive Center. 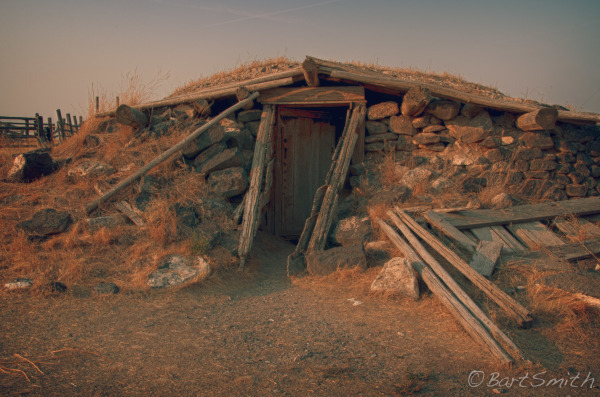 It was built atop Flagstaff Hill roughly 8 miles from Baker City and well worth a visit. Oregon. 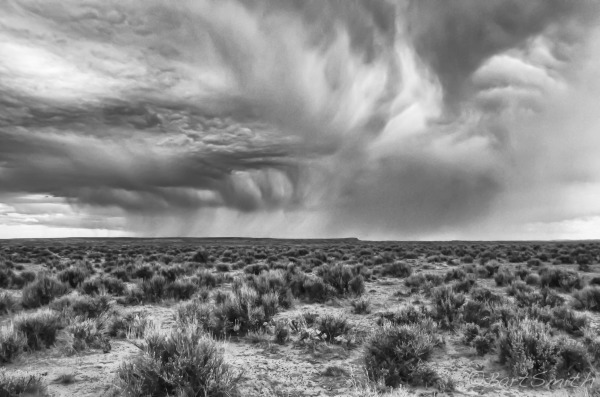 Dynamic weather over the Blue Mountains from along the Oregon trail near the town of North Powder. Oregon. 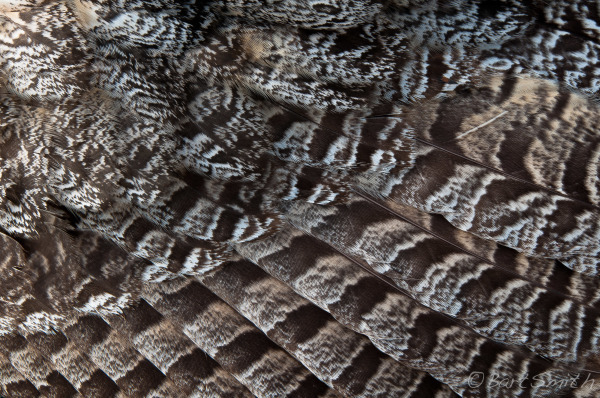 Close-up of deceased owl along Interstate 84. Oregon. 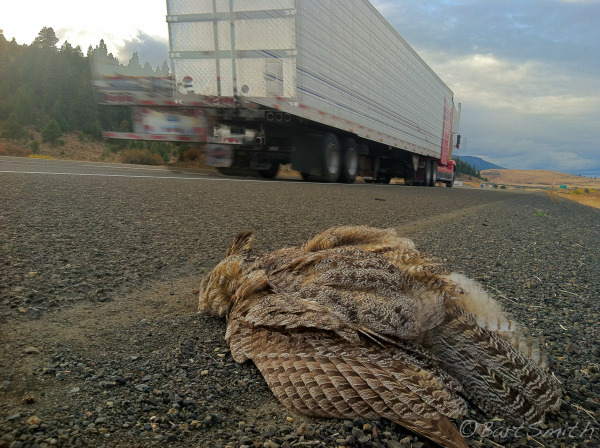 Deceased owl along Interstate 84. Oregon. 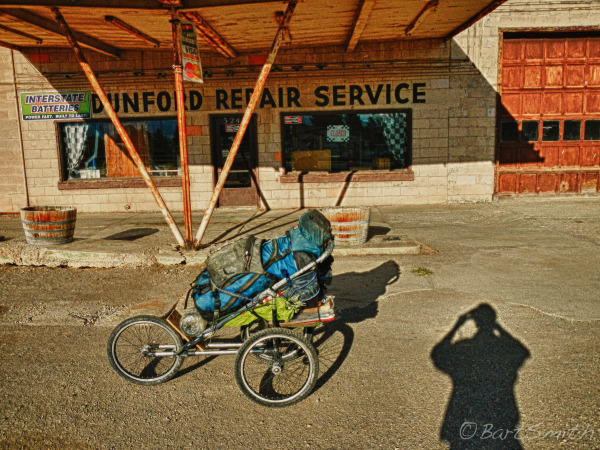 "This is my post pal", Pendleton Oregon. 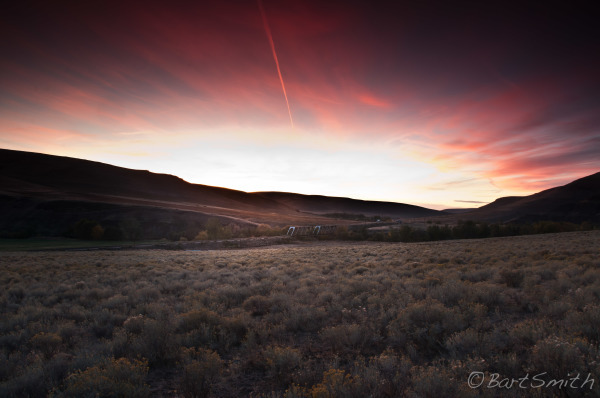 Dusk along Umatilla River Valley. Oregon. 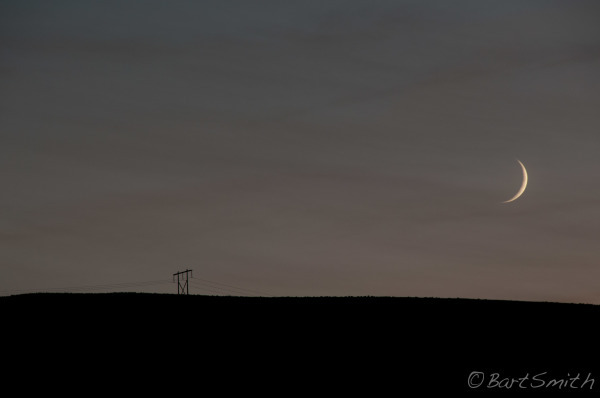 Moonset along Umatilla River Valley. Oregon. 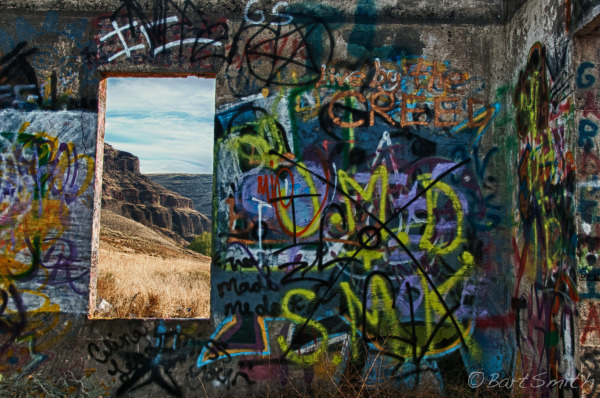 Graffiti on abandoned house along Umatilla River Valley. Oregon. 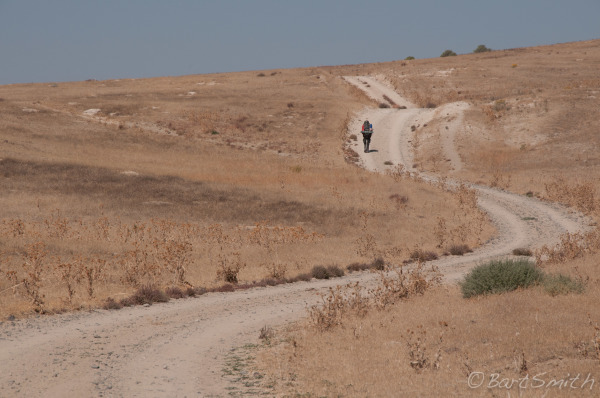 Ruts along the Oregon Trail through Echo Meadows. An excellent demonstration of swales and ruts five miles west of the town of Echo, Oregon. 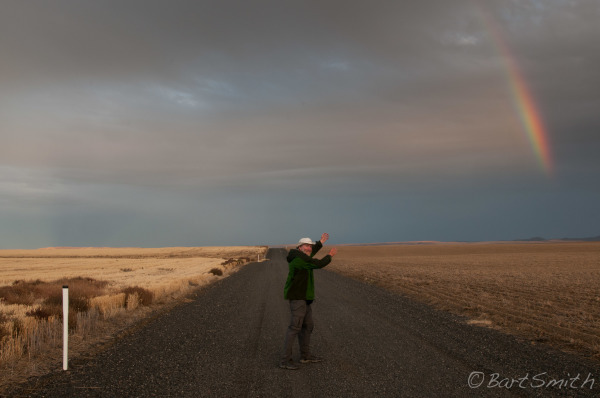 Chasing rainbows along the Oregon Trail through Umatilla River Valley, Oregon. 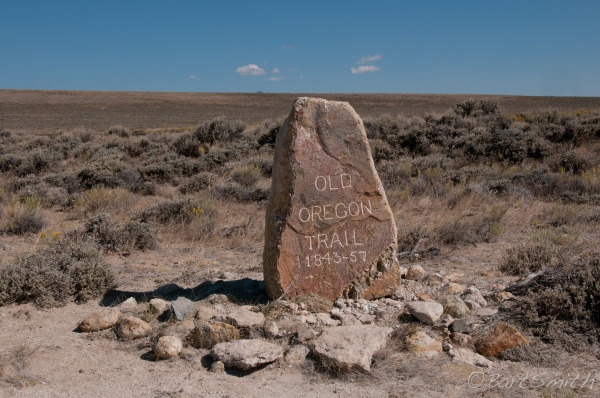 Following the general route of the Oregon Trail through Umatilla River valley, Oregon. 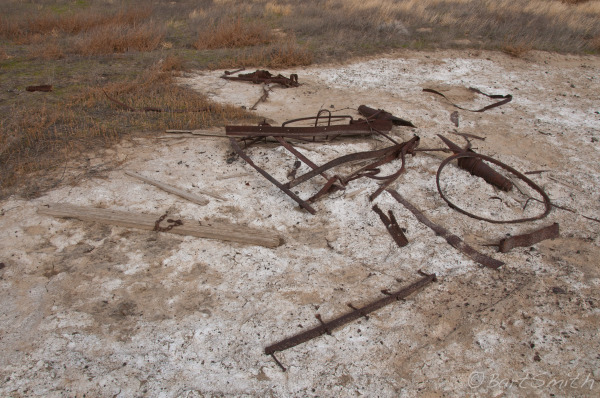 Wagon parts scattered at Well Spring. 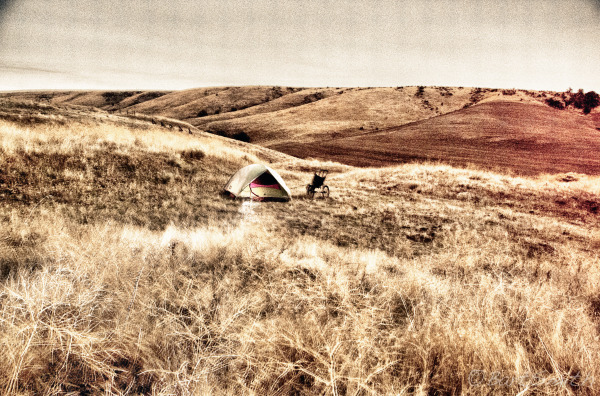 A popular camp location along the Oregon Trail south of Boardman Bombing Range. Oregon. An Oregon Trail sign along Eighteen Mile Canyon. Oregon. 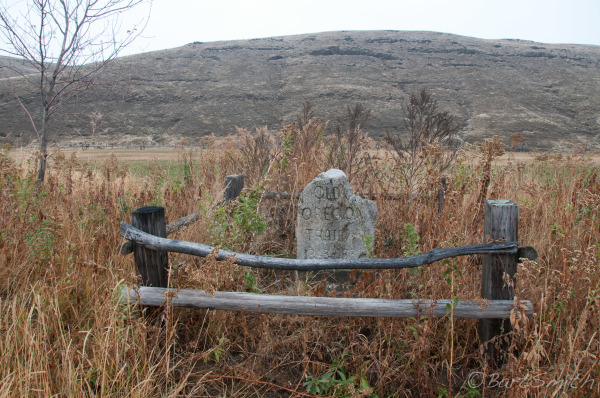 Monument at site of McDonald Ford where the Oregon Trail crossed the John Day River. Oregon. 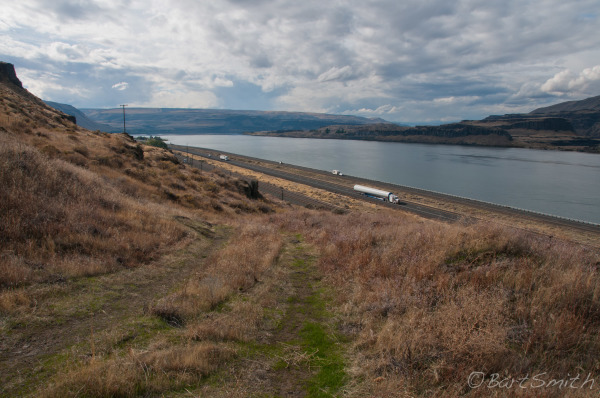 Columbia River from short stretch of The Oregon Trail still evident a few miles west of Biggs junction Oregon. 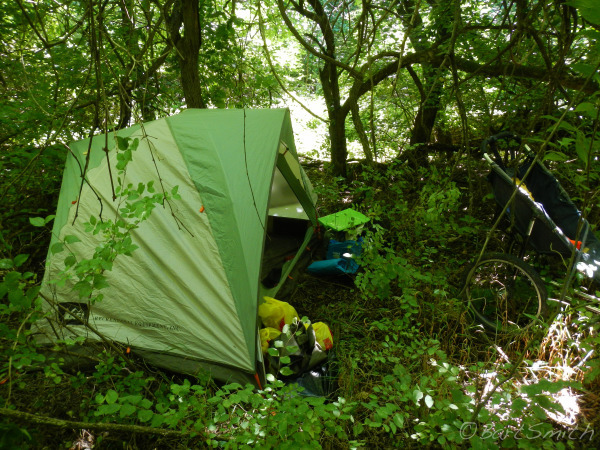 Camp along Pine Creek Valley, Oregon. Laurel Hill, a very steep descent for the emigrants and their wagons. A few miles west of Barlow Pass. along HW 26. Oregon. 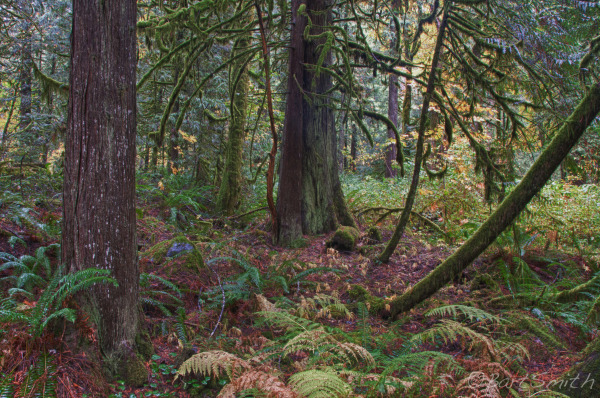 Cedar Forest along trail section of the Barlow Road route descending the Cascades. Near Zig Zag Oregon. 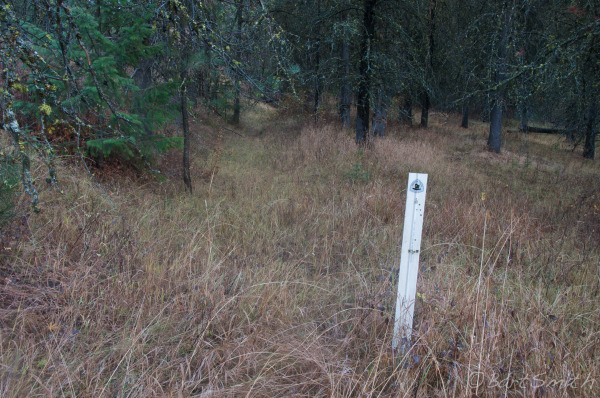 Trace of Barlow Road still evident a few miles east of Rhododendron Oregon. 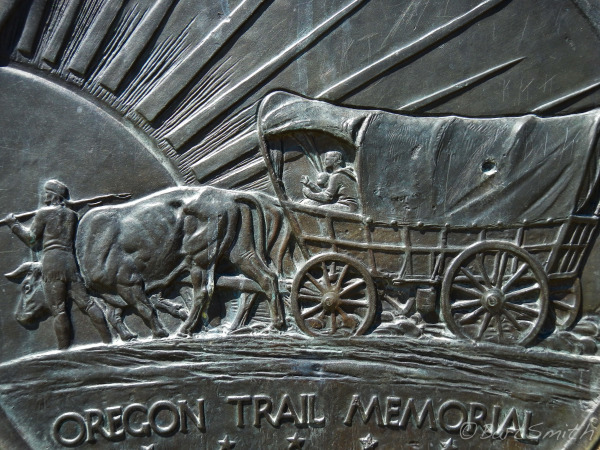 Oregon Trail Monument. Near Rhododendron Oregon. 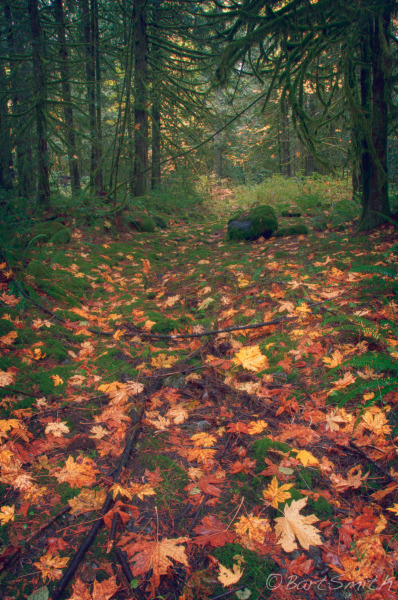 Forest just out side Oregon City. By the time many emigrants arrived at Portland most of the grand trees were cut down and many emigrants commented on the "forest of stumps". 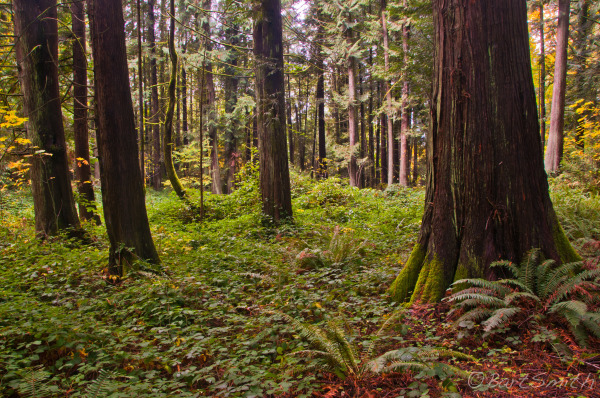 170 years later this forest has returned. One tired wet puppy upon completing my 2012 Oregon Trail walk. 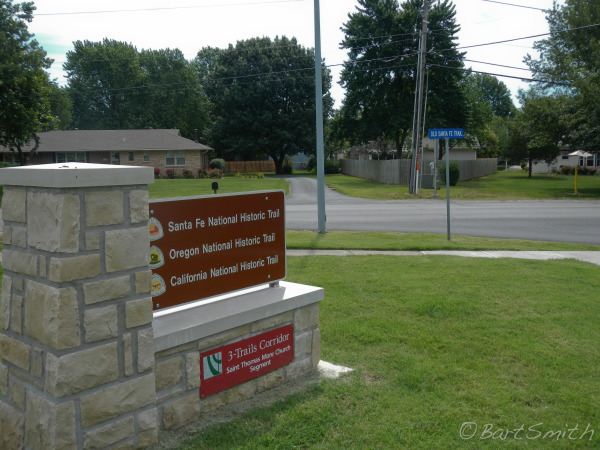 I started at Independence MO on June 15 and finished here at the End of the Oregon Trail Interpretive Center on October 31. 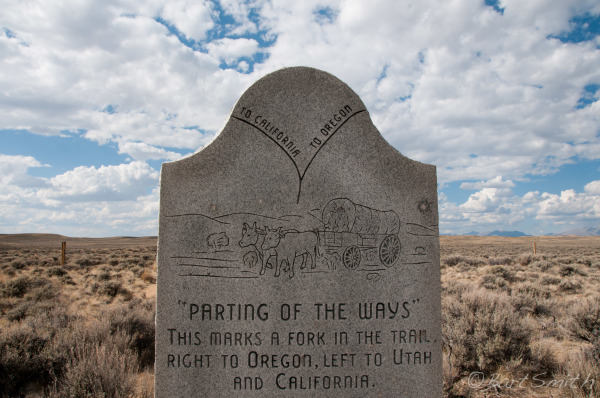 Hundreds of thousands of emigrants followed this 1,200 mile route in the 1840s and 1850s leaving the United States for the fabled Oregon Territory in search of wealth and fresh opportunities. 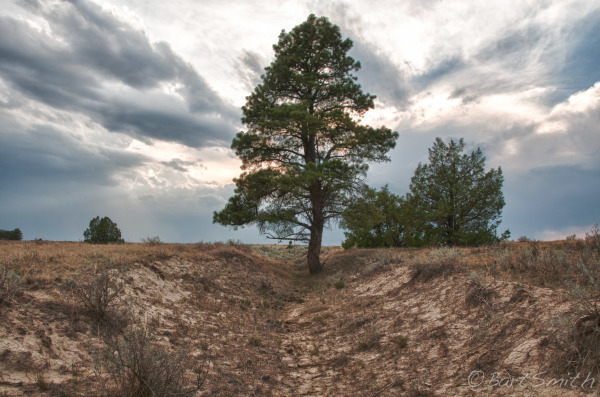 Families and individuals traveled in covered wagon trains that crossed the Grat Plains and snaked through rough mountain terrain. 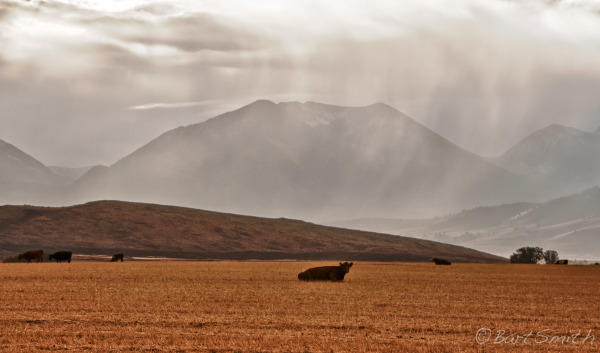 This overland route crossed the Rocky Mountains at South Pass in what is now Wyoming, an area first explored by European fur traders in the early 1800s. In 1836 a missionary party headed by Marcus and Narcissa Whitman proved that it could be accomplished by wagon - and the flood of westward expansion began. 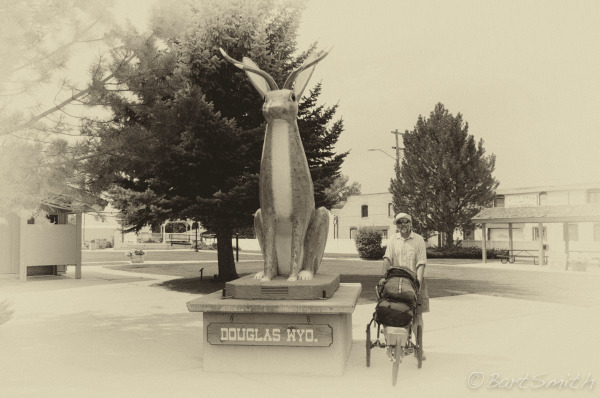 The Oregon NHT today stretches over 2000 miles of routes between Independence, Missouri, and Oregon City, Oregon and is administered by the National Park Service in close partnership with the Oregon-California Trails Association. 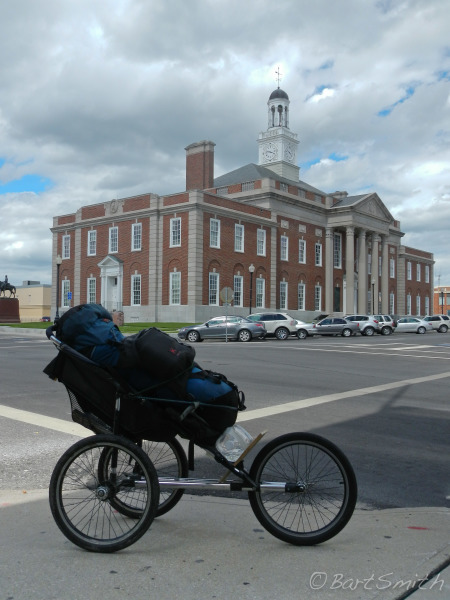 The was the first national historic trail added to the National Trails System - and many of the underlying concepts for NHTs were articulated in this trail's feasibility study.